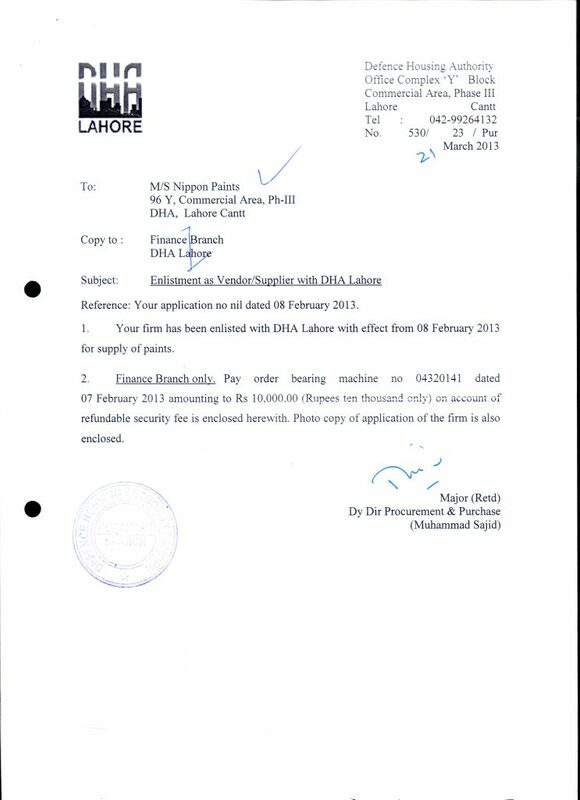 For placing your trust & confidence in us! In 2012, Nippon Paint Color Way of Love was nominated the“outstanding public welfare program” by “Public Welfare of China”. 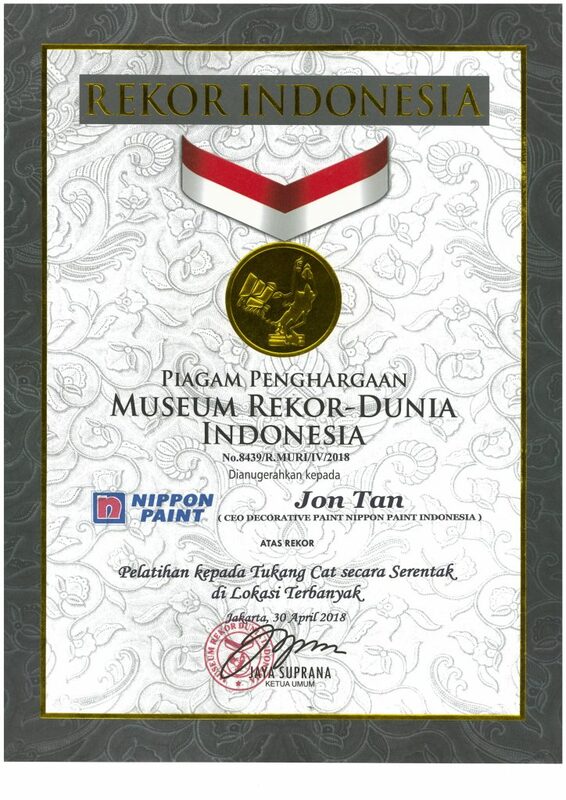 In 2012, Nippon Paint Color Way of Love was nominated“the most influential CSR event 2012” by 17PR. In 2012, Nippon Paint Color Way of Love ranked as the “Top 100 Innovation of China CSR” by Social and Public Welfare magazine. In 2012, Nippon Paint Color Way of Love won three awards in the 2nd China Charity Festival. In 2012, the best innovation of public welfare; 2012 best public welfare image of the year; People of the year by China Public Welfare Award. In 2012, China Education News Network, Nippon Paint Color Way of Love was awarded the most influential brand of public welfare of the year by China Education. In 2012, China Public Network, Nippon Paint Color Way of Love won the most influential CSR event award. 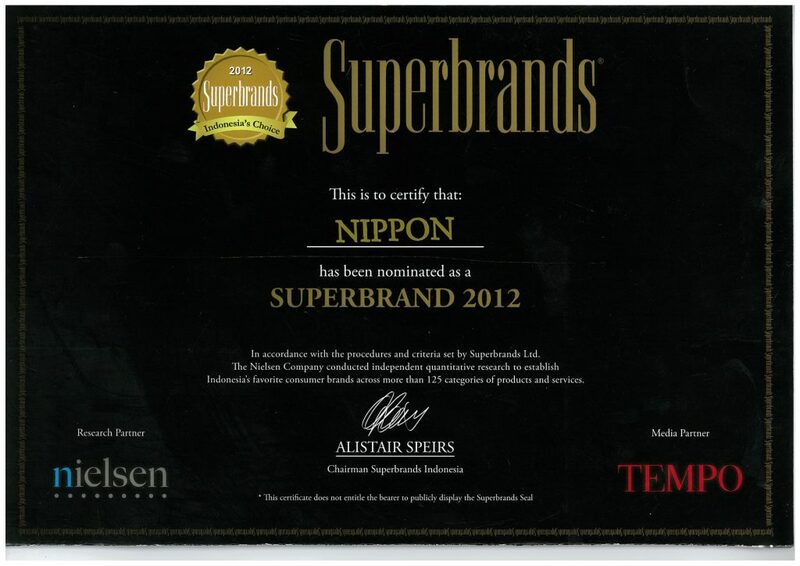 In 2012,Superbrands, the Preferred Brand of Chinese. 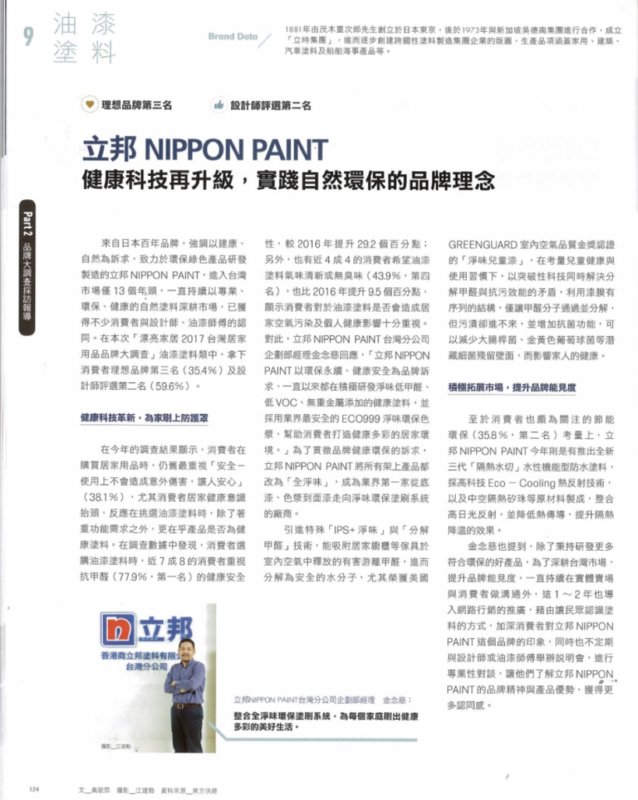 In 2012, Nippon Paint was awarded the 1st preferred paint vendor by China Top 500 Real Estate Developers. 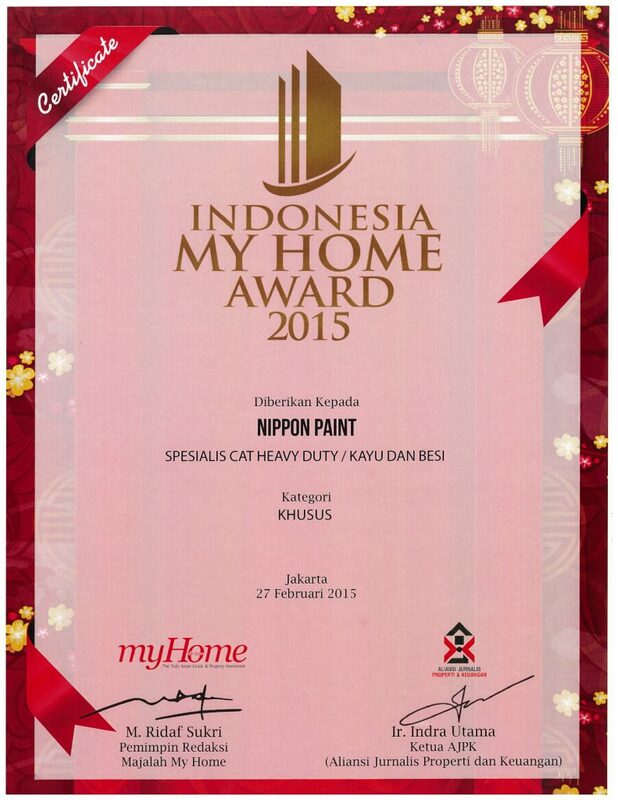 In 2012, Netease Home, Nippon Paint was awarded the best after-sales service of home furnishings enterprise. In 2012, the series selection of 10 years travel for waterborne paint, Nippon Paint was included the list of Top 10 Enterprise of Cultivating Chinese Waterborne Paint Market. In 2012, “China Brand Value Management Forum”, Nippon Pant was awarded “the Best International Brand of Construction Case in China”. In 2013, the 3rd China Charity Festival, Nippon Paint China won the Public Welfare. Annual Group Award. In 2013, the 3rd China Charity Festival, Eric Chung won the Public Welfare People Award. In 2013, the 3rd China Charity Festival, Color Way of Love won the Best Public Welfare Award. In 2013, the Best PR Innovation. In 2013, Media 360, Refresh for Love won the bronze award of Integrated Marketing Promotion Project. In 2013, Shopping Guide, 2013 Decoration White Book for White-Collar won the Most Social Responsibility Award. In 2013, the 5th China excellent enterprise responsibility summit, awarded the Chinese social responsibility model enterprise. In 2013, the 5th China excellent enterprise responsibility summit, Wee Siew Kim won the outstanding Chinese entrepreneur performing social responsibility. In 2013, China Brand Power Index, the 1st brand of 2014C-BPI wall paint. 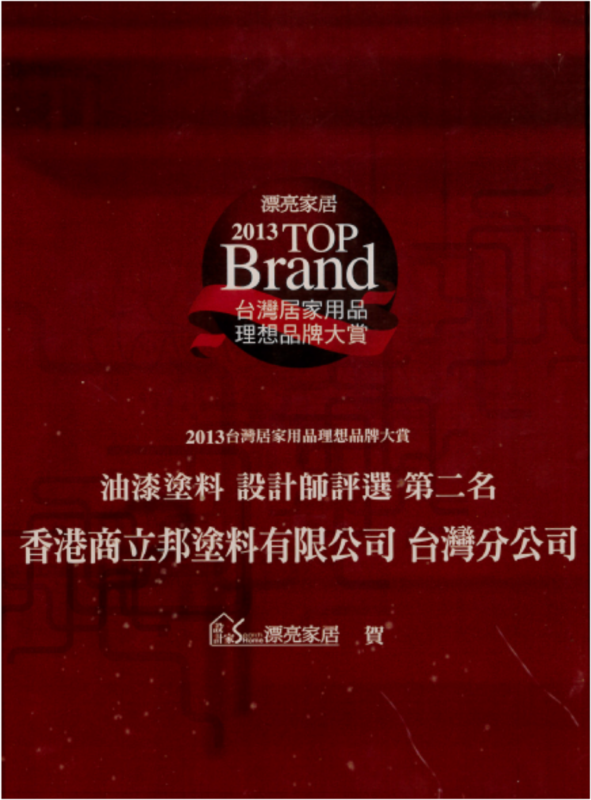 In 2013, China Brand Power Index, the 1st brand of 2014C-2013BPI wood paint. In 2013, Media Relations Awards-Best PR Innovation honorable mention. In 2013,Superbrands, the Preferred Brand of Chinese. 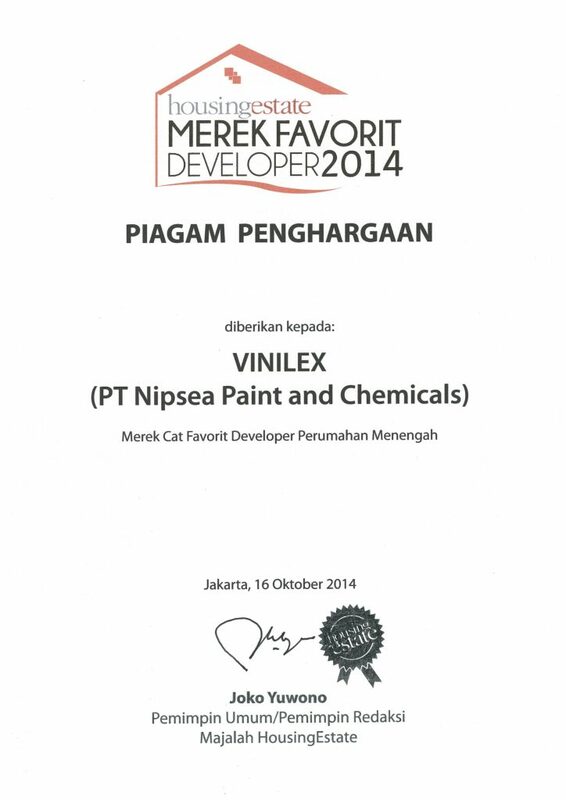 In 2013, Nippon Paint was awarded the 1st preferred paint vendor by China Top 500 Real Estate Developers. In 2014, the 4th China Charity Festival, the China Public Welfare Annual Group Award of Year 2014. In 2014, the 4th China Charity Festival, Nippon Paint China President Eric Chung won the China Public Welfare People Award of Year 2014. In 2014, the 4th China Charity Festival, Nippon Paint Society Care Project, Refresh for Love, was awarded the Best Public Welfare Project. In 2014, China Brand Power Index, the 1st Brand of 2014C-BPI Wall Paint. In 2014, China Brand Power Index, the 1st Brand of 2014C-BPI Wood Paint. In 2014, the Beijing Morning Post, the flagship brand of house and home in Beijing. 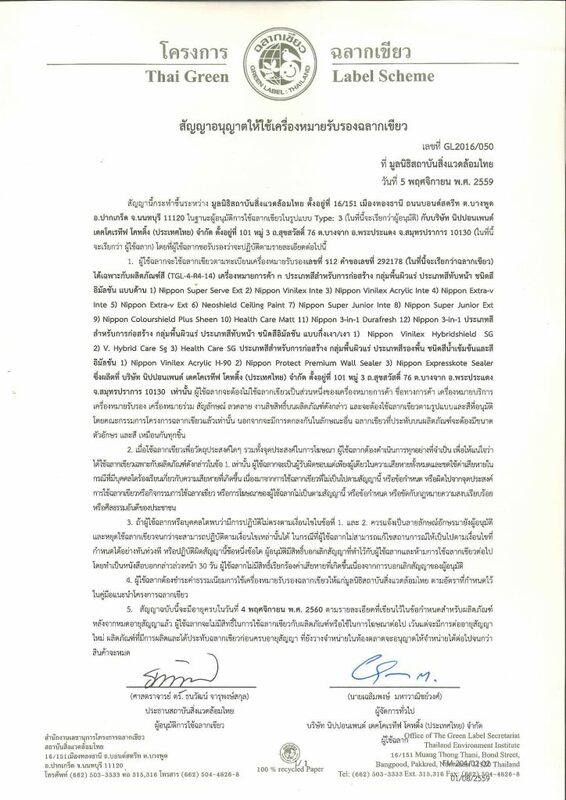 In 2014, Media 360, the public welfare award of market and communication. 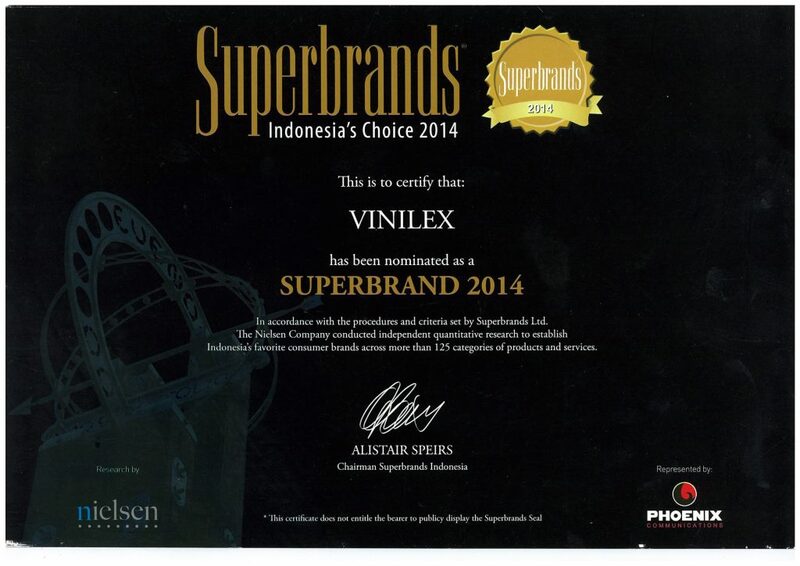 In 2014,Superbrands, the Preferred Brand of Chinese. 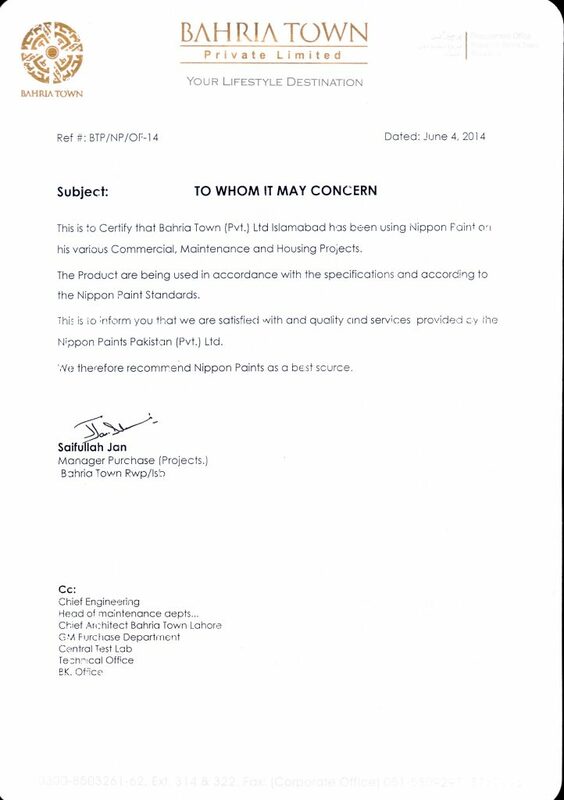 In 2014, Nippon Paint was awarded the 1st preferred paint vendor by China Top 500 Real Estate Developers. 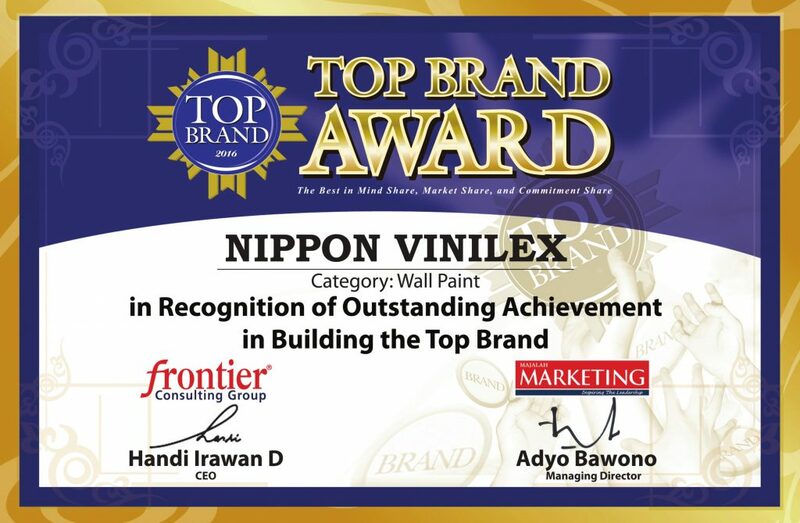 In 2014, the 9th China Top 10 paint brand selection, Nippon Paint was awarded the Top 10 foreign wall paint brand. 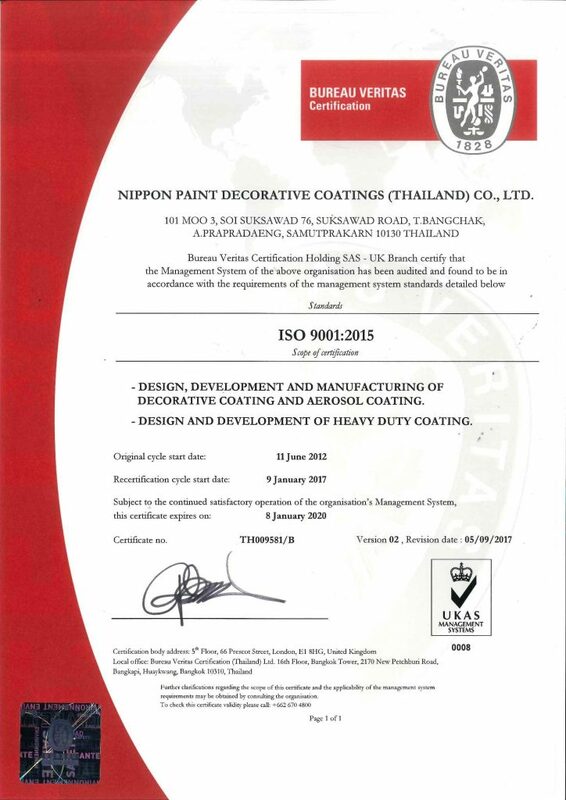 In 2014, the 9th China Top 10 paint brand selection, Nippon Paint was awarded the Top 10 exterior wall paint brand. 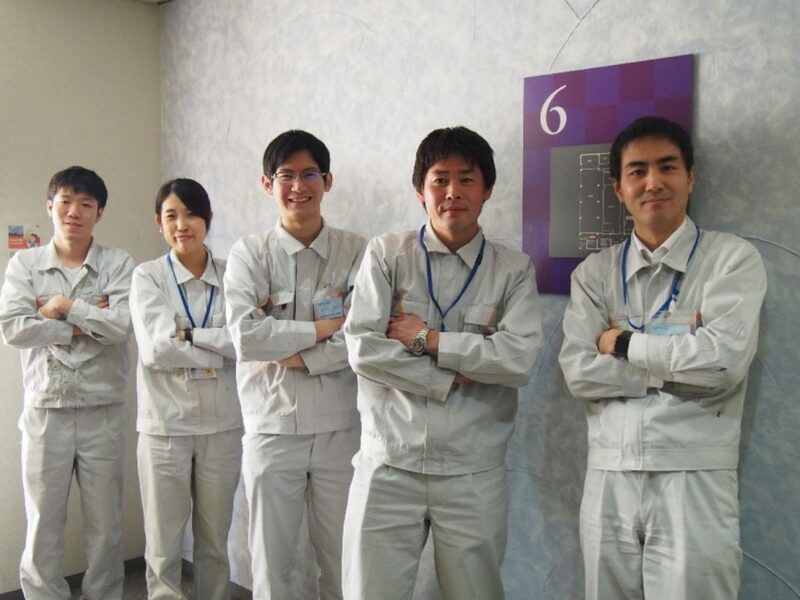 In 2014, Nippon engineering was awarded the Vanke A-class supplier. In 2014, SouFan, the consumers favorite building materials brand of Year 2014. In 2014, Netease Home, the best after-sales service of home furnishings enterprise of Year 2014. In 2014, the IAIR AWARDS, “the Best Enterprise of Asia Paint Technology Leadership Award”. In 2014, Supe Chemical project, the WuHu Cigarette Factory, was awarded the title of “Top 10 annual floor project”. In 2014, Shenyang Brilliance Jingbei Auto Limited Company, Nippon Auto paint was awarded “the Outstanding Contribution Prize”. 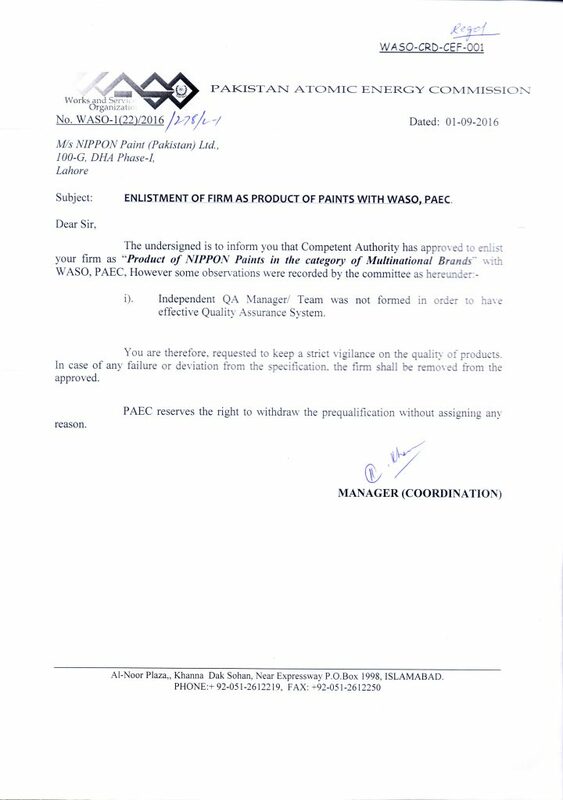 In 2014, Haima Auto Limited Company and Faw Haima Auto limited Company, Nippon Auto paint won “the Annual Quality Prize. 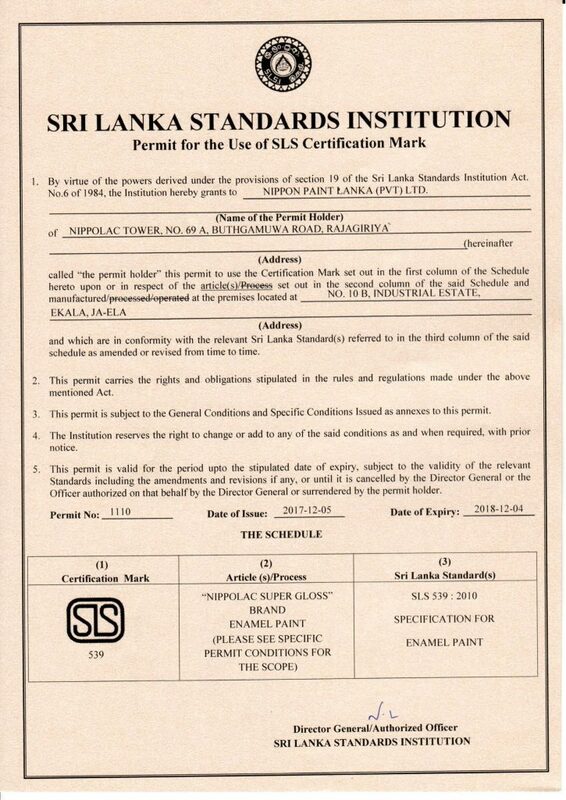 In 2015, Nippon Paint the 2014 CSR report won the annual report silver prize in ASIA-PACIFIC STEVIE AWARDS. In 2015, Nippon Paint Color Way of Love won the CSR annual bronze prize in ASIA-PACIFIC STEVIE AWARDS. In 2015, Nippon Paint China Social Care Project honorable mentioned the Best CSR Program by Regan Awards. 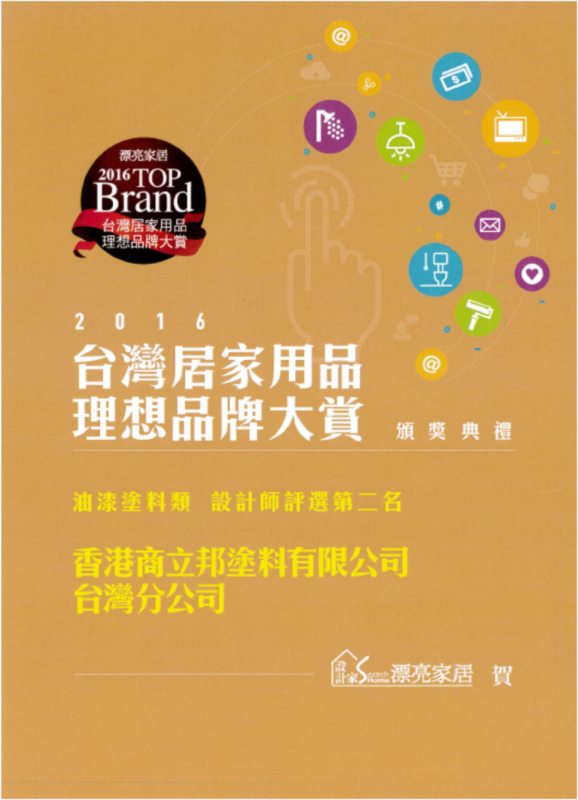 In 2015, China Brand Power Index, the 1st Brand of 2014C-BPI Wood Paint. In 2015, Superbrands, the Preferred Brand of Chinese. 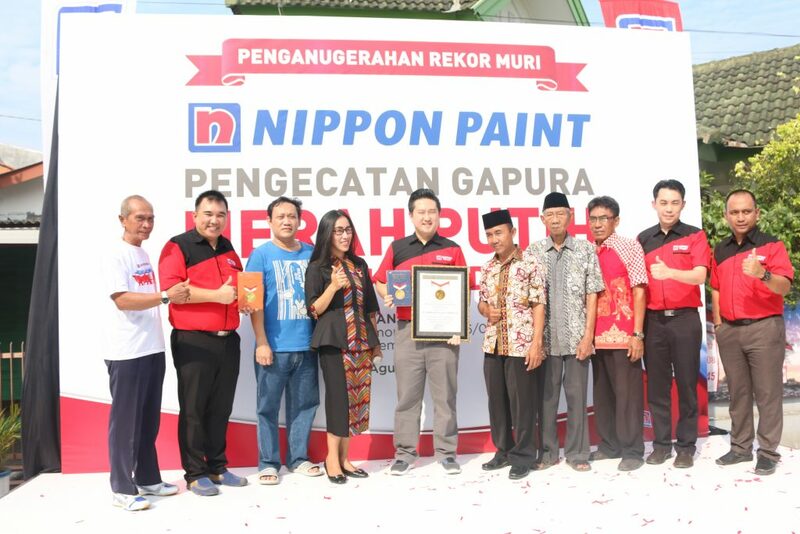 In 2015, Nippon Paint was awarded the 1st preferred paint vendor by China Top 500 Real Estate Developers. 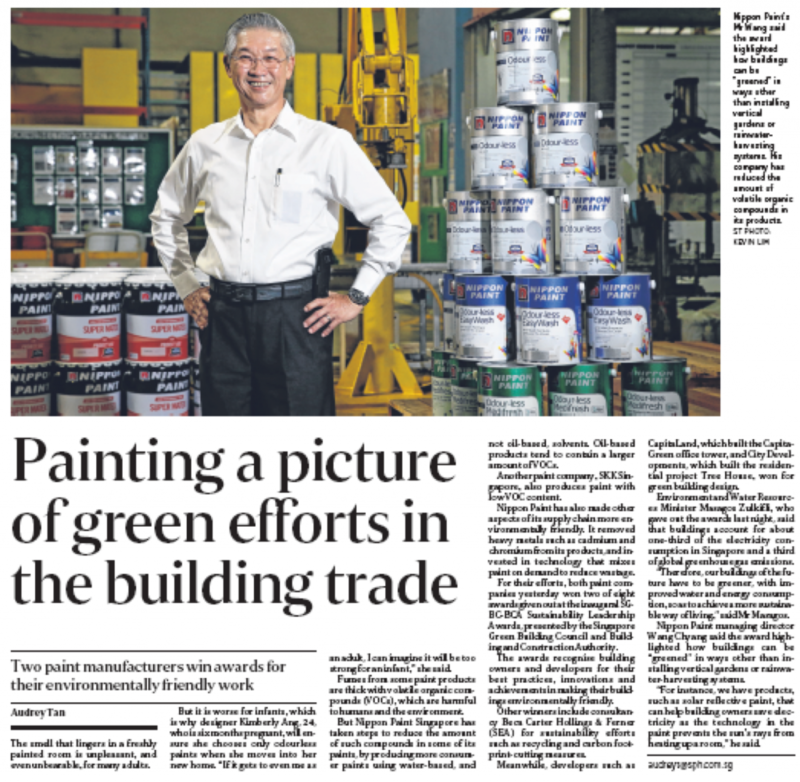 In 2015, Paint Brand List, the Top 10 Foreign Brand of Wall Paint. 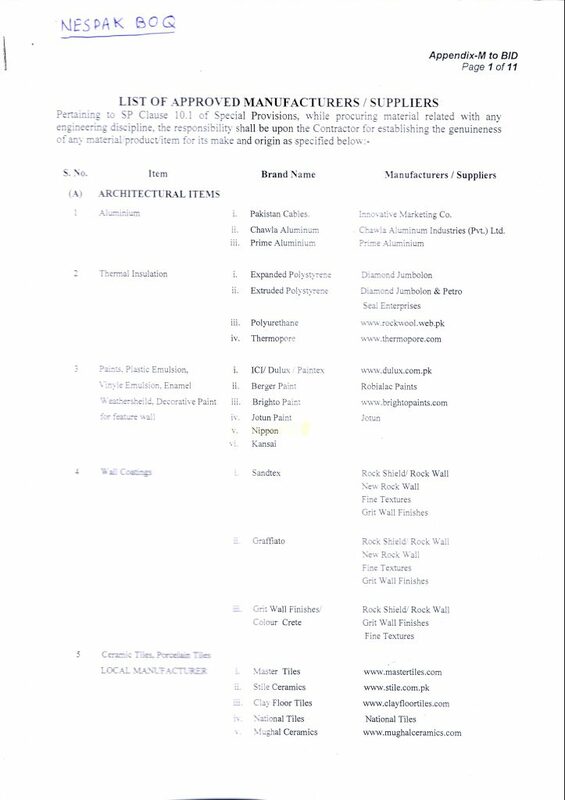 In 2015, Paint Brand List, the Top 10 Outer Wall Paint Brand. 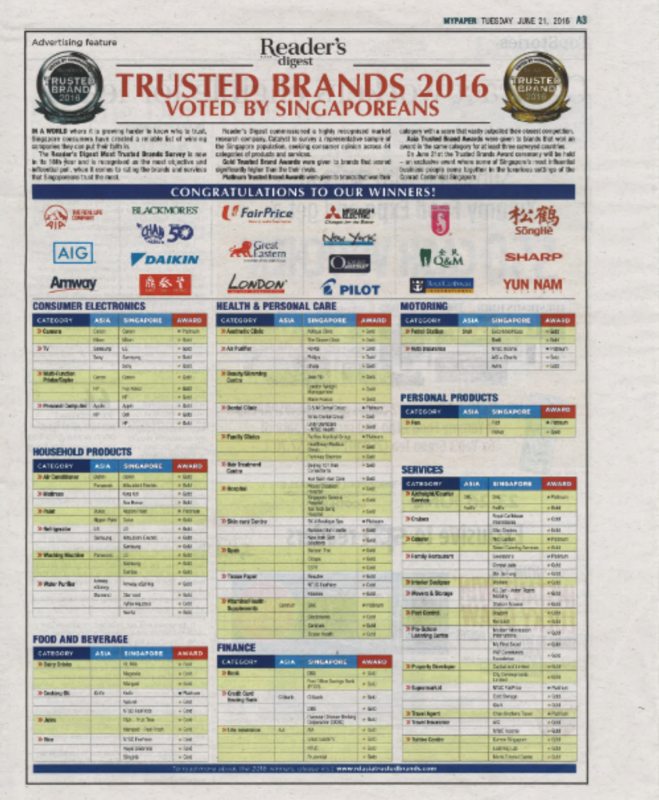 In 2015, Paint Brand List, the Top 10 Powder Paint Brand. In 2015, Paint Brand List, the Top 10 Wood Paint Brand. 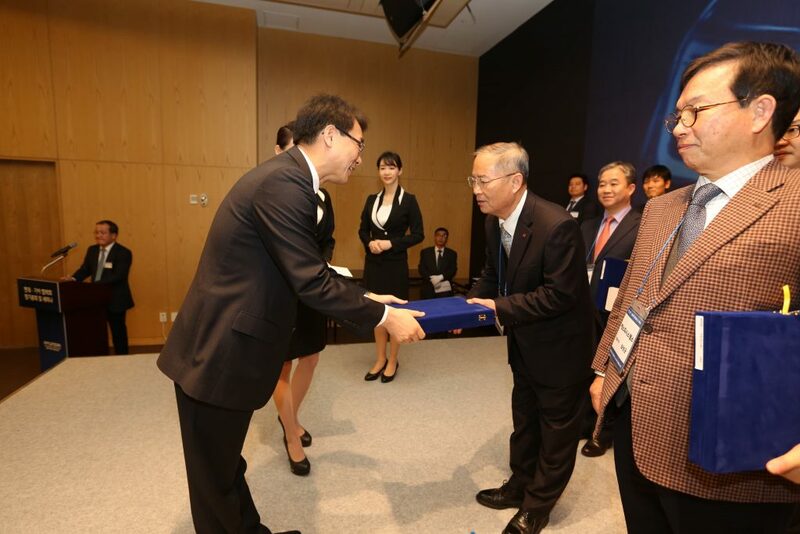 In 2015, Nippon engineering was awarded the Vanke A-class supplier. In 2015, China Paint Daily, the Dealers Favorite Top 10 China Paint Brand. In 2015, China Paint Gold Award, the Top 10 Inner Wall Paint Brand. In 2015, China Paint Gold Award, the Top 10 Outer Wall Paint Brand. In 2015, China Paint Gold Award, the Top 10 Engineering Coating Brand. In 2015, Nippon Paint Dream Home Transformer won the Golden Case Award of 2015 China Great Wall TV media and enterprise cooperation. In 2015, Nippon Paint Color Way of Love won “the Brand Public Welfare Award” at the 2015 Great China Effie Awards. In 2015, Market China, the Childhood Dream, the public welfare marketing project, won the 2015 Industry Innovation Marketing Case Golden Award. In 2015, Nippon Paint China won the 2nd Pudong Headquarters Economic Top 10 Classic Model Innovative Award of Transformation. 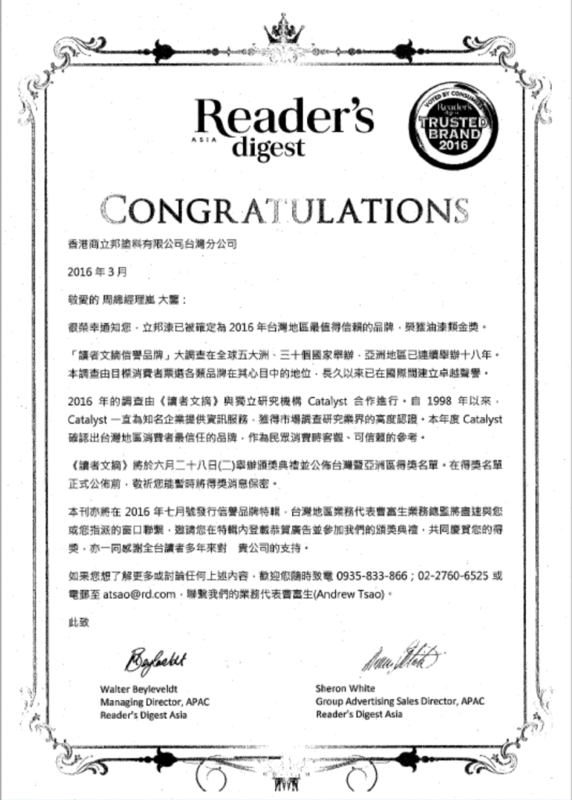 In 2015, China Business Daily, was awarded the 2015 CSR China Enterprise. In 2015, the 5th China Charity Festival, Nippon Paint China won the Annual Public Welfare Group Award. In 2015, the 5th China Charity Festival, Eric Chung won the Annual Public Welfare People Award. In 2015, Roca2015PChouse Fashion Design Ceremony, was awarded the Most Influential Paint Brand. In 2015, China Top 10 Paint Brand Selection, Supe Chemical was awarded the China Whole Floor Paint Supplier. In 2015, China Top 10 Paint Brand Selection, Supe Chemical was awarded the title of Top 10 Waterproof Paint Brand. In 2015, China Paint Industry 100 Years Award, Nippon Paint China was awarded the “Top 100 Enterprise in China Paint industry 100 Years”. In 2015, China Paint Industry 100 Years Award, Nippon Paint China president Eric Chung was awarded “the Outstand Entrepreneur in China Paint industry 100 Years”. In 2016, Superbrands, the Preferred Brand of Chinese. 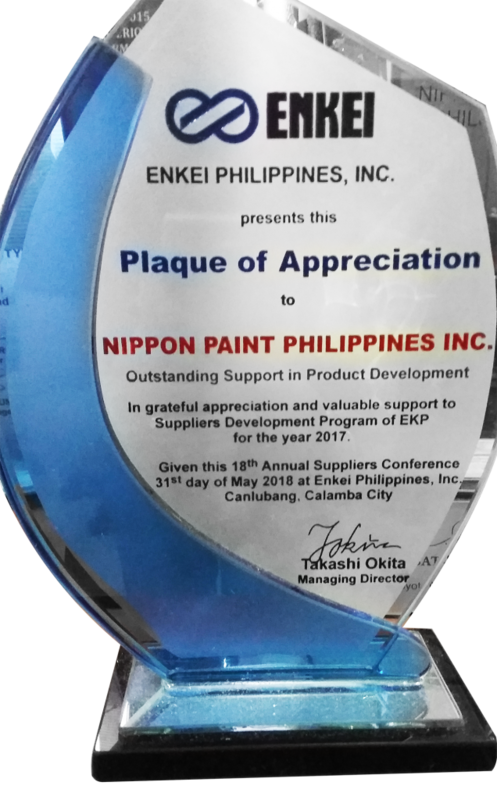 In 2016, C&C Truck 2016 Annual Business Meeting, Nippon Paint was awarded the Year 2015 Excellent Supplier and Excelsior Prize. In 2016, China Paint Gold Award, the 2015 Top 10 Inner Wall Paint Brand. In 2016, China Paint Gold Award, the 2015 Top 10 Wood Paint Brand. In 2016, China Paint Gold Award, the 2015 Top 10 Engineering Coating Brand. In 2016, China Paint Gold Award, Eric Chung was awarded Person of the Year 2015. 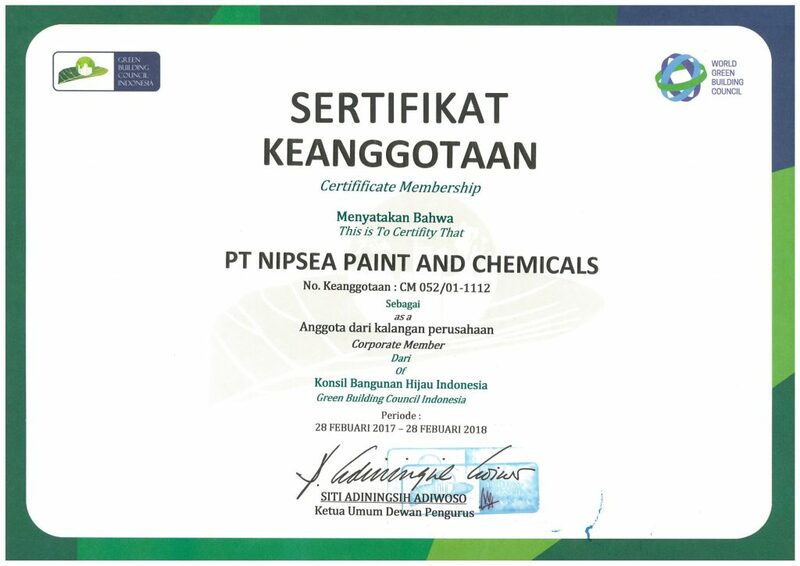 In 2016, Nippon Paint was eligible for the list of Year 2016 Shanghai Chemical building materials Top 10 Brand. In 2016, CLS Award, the influence exterior wall paint brand. In 2016, CLS Award, the influence powder paint brand. In 2016, CLS Award, the influence wall paint foreign brand. In 2016, China Finance summit, the image award of 2016 outstanding brand. In 2016, China Finance summit, Eric Chung has been awarded the influence person of Year 2016 in paint industry. In 2016, “CSR China Education Award:, Color Way of Love won “the Best Sustainable Development Award”. In 2016, “CSR China Education Award:, Color Way of Love won “the CSR New Medial Promotion Weibo Special Award”. In 2016, “CSR China Education Award:, Color Way of Love won “the CSR New Medial Promotion Public Special Award”. 2016 China Paint Brand List, “the Famous Building Paint Brand”. 2016 China Paint Brand List, “the Famous China Wood Paint Brand”. 2016 China Paint Brand List, “the Famous China Auto Paint Brand”. 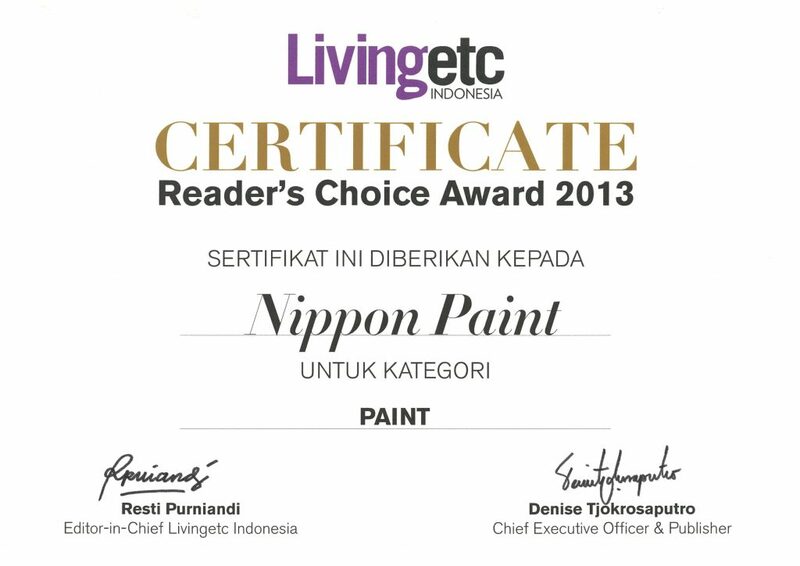 2016 the Annual Global Trends Festival, Nippon Paint Color Way of Love won “the Fashion Reputation Award”. 2016 Ragan Award, Nippon Pain Color Way of Love art +project was honor awarded the CSR Campaign of the Year. 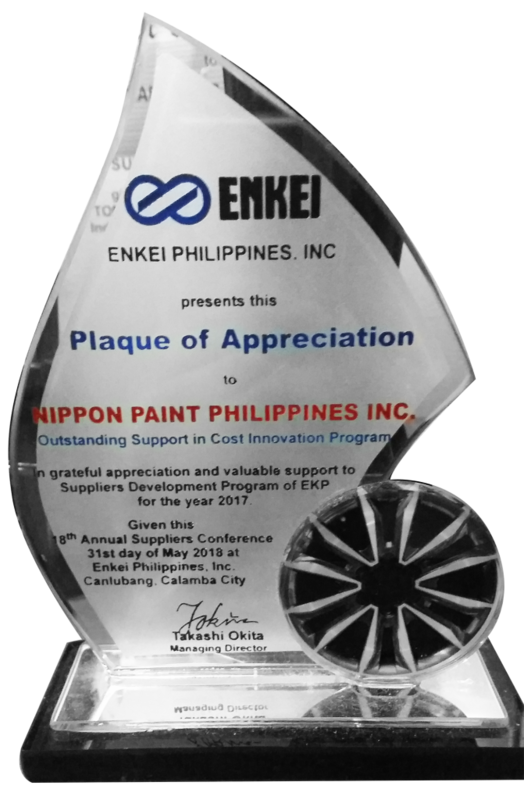 In 2017, Nippon Paint was awarded the Vanke A-class supplier. 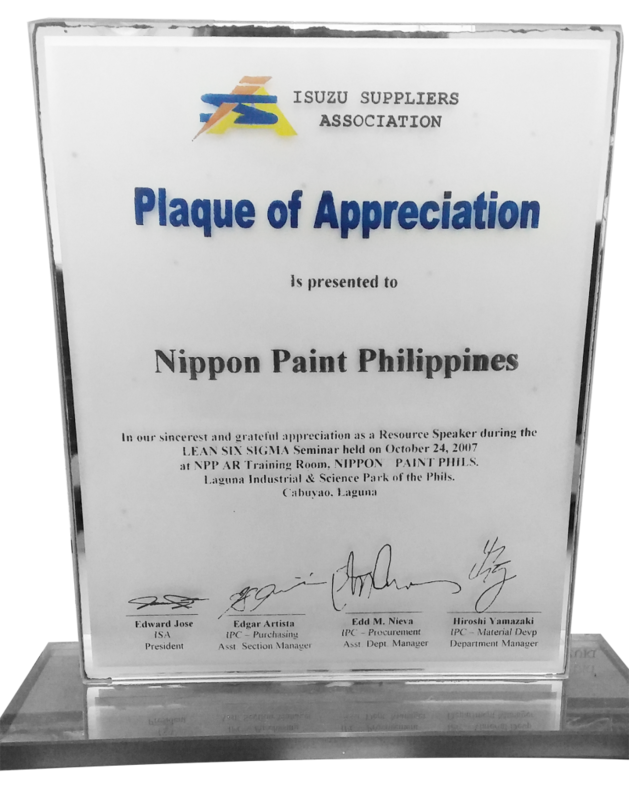 In 2017, Nippon Paint was awarded the annual service model of household industry. In 2017, 2016 Golden Bee Enterprise CSR- China List, the Harmonious Contribution Award. 2017 China Paint Brand Ceremony, CLS Award, “the influence exterior wall paint brand”. 2017 China Paint Brand Ceremony, CLS Award, “the influence engineering paint brand”. 2017 China Paint Brand Ceremony, CLS Award, “the influence wood paint brand”. 2017 China Paint Brand Ceremony, CLS Award, “the influence powder paint brand”. 2017 China Paint Brand Ceremony, CLS Award, Supe won “the influence waterproof paint brand”. 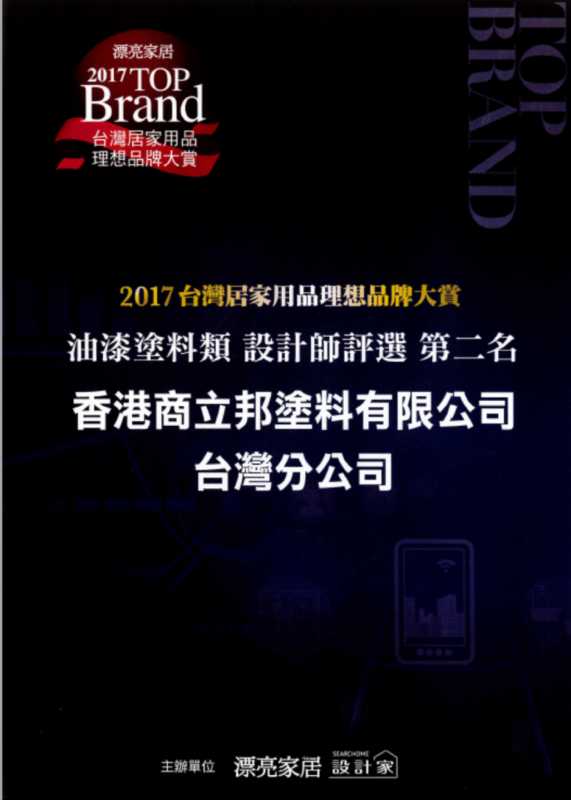 2017 China Financial Summit, the excellent brand image award of 2017. 2017 China Financial Summit, Eric Chung has been awarded the influence person of Year 2017 in Paint industry. 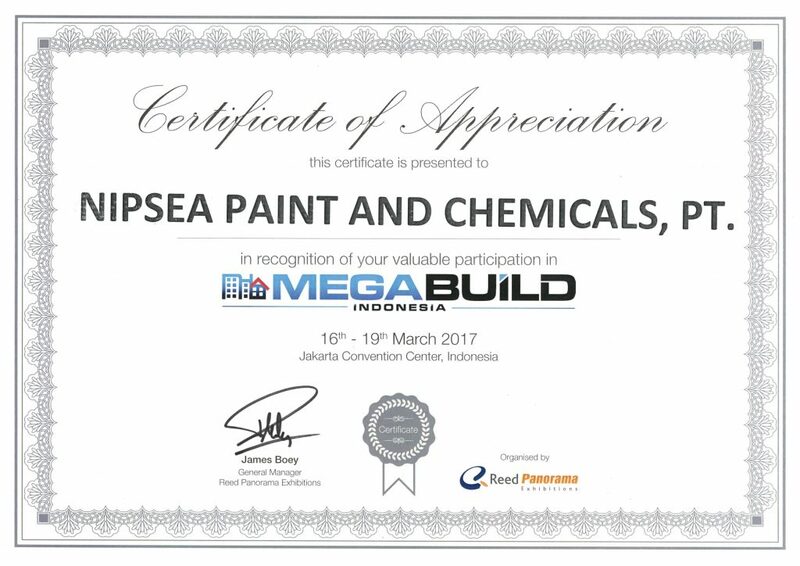 In 2017, Nippon Paint was included in the list of 2017 Shanghai Chemical and building industry Top 10 Brand of Children Paint and Inner Wall Paint. 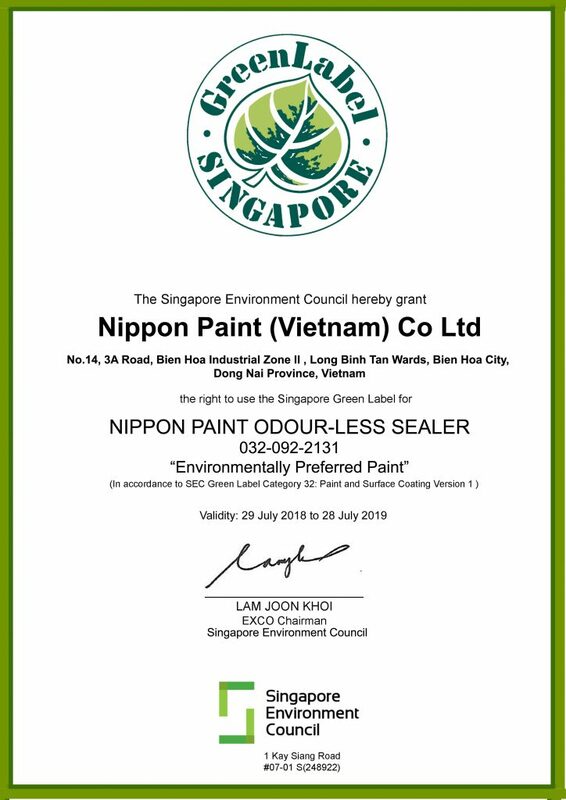 In 2017, Nippon Paint won the Shanghai Enterprise Standard Leader Five-Star Standard Reputation Award. 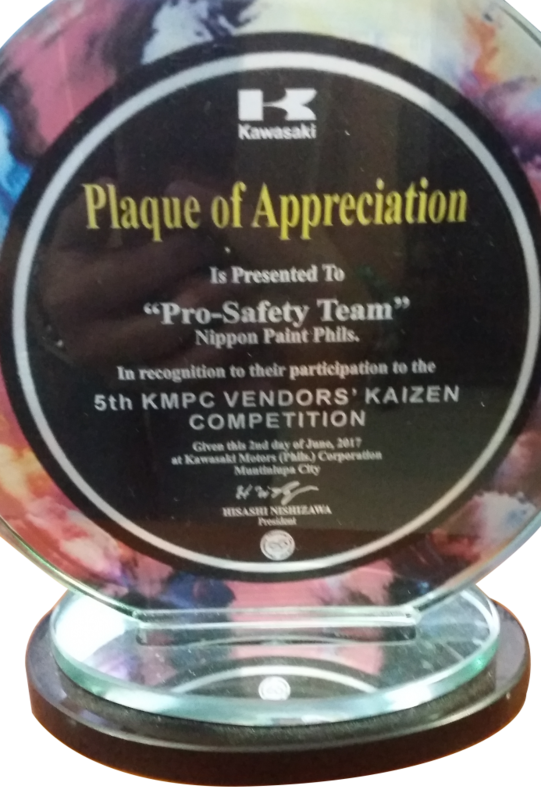 2017 Ragan Award, Nippon Paint Color Way of Love art +project won “the CSR Campaign of the Year Honor Award. 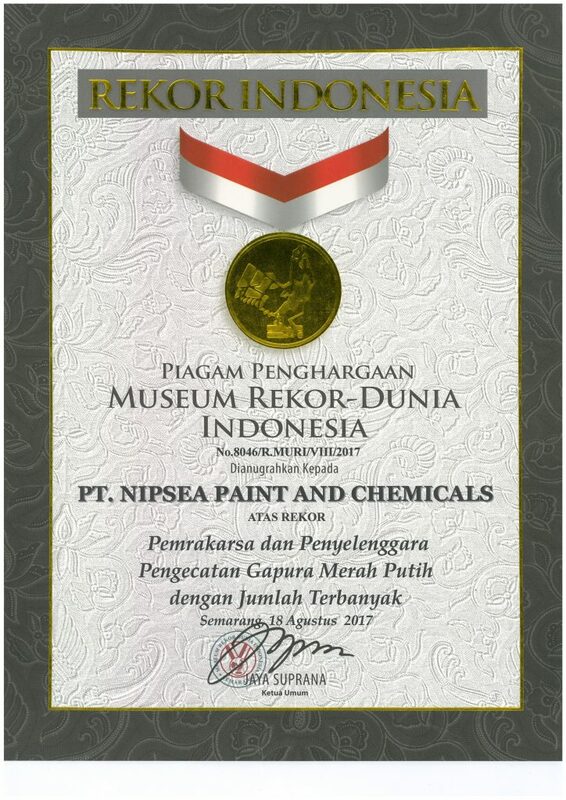 2017 Ragan Award, Nippon Paint Color Way of Love art +project was honor awarded “the Best Media Relation Activity”. 2017 Ragan Award, Nippon Paint China Enterprise CSR report 2016 was honor awarded the best CSR report. In 2017, won the Year2016-2017 Outstand Brand Market and Outstanding Public Welfare Award by The Economic Observer and Hong Kong Management Association. In 2017, Nippon Paint Dream Home Transformer won the Integration of digital media Bronze Award of ROI Festival Business Creative Award. In 2017, Nippon Paint Dream Home Transformer won the Bronze Award of China Great Wall Media Marketing. In 2017, the 2017 China home industry brand innovation Summit and Annual awards ceremony of Tencent Home, Nippon Paint was awarded the 2017 brand great award——the Favorite Brand of Consumers. In 2017, Nippon Paint was awarded the 2017 Jinmao National Strategic partners. In 2018, won the Public Welfare Innovation Award of the 2017 China Foreign-invested Enterprises Fulfill Social Responsibility Excellent Cases. In 2018, Nippon Paint was awarded Evergrande Real Estate Group the 2017 Excellent Supplier Award. 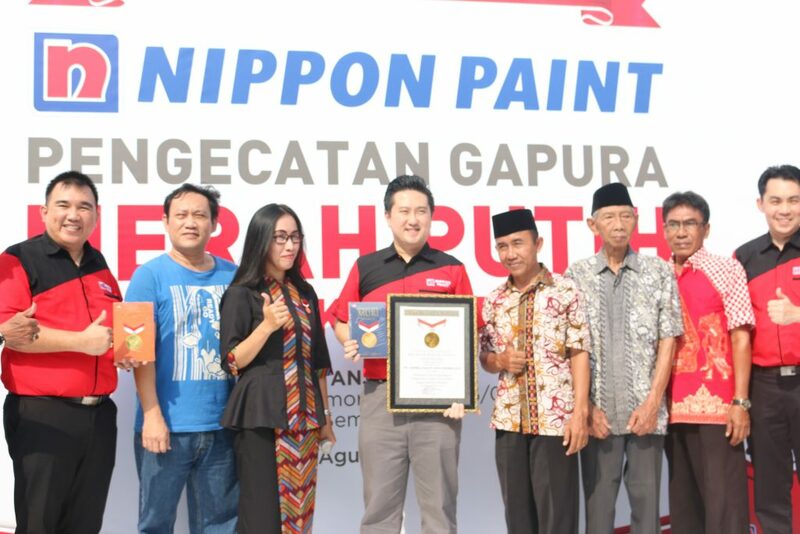 In 2018，the Annual Event of Cultural and Cultural Responsibility, Nippon Paint Dream Home Transformer won Annual Life Program Award. In 2018, Nippon Paint was awarded Netease Home the 315 Report 1st of Comprehensive ranking of service quality in Paint industry. 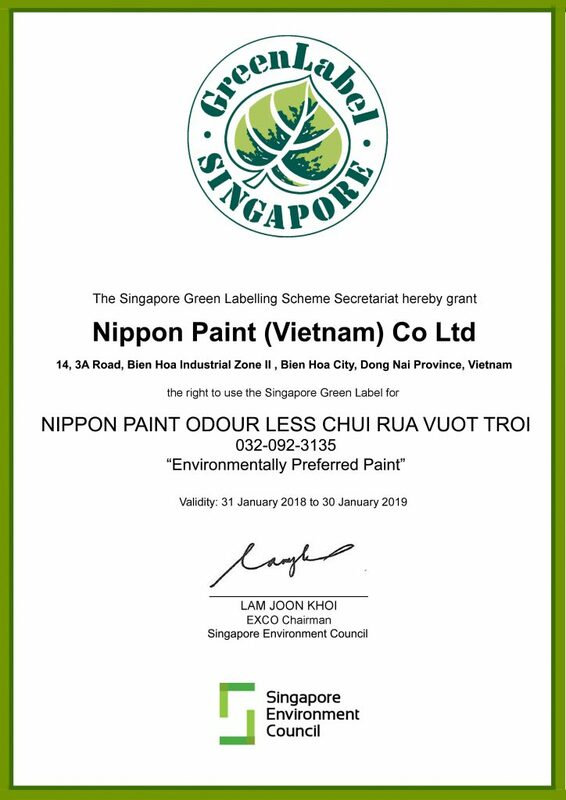 In 2018, Nippon Paint was awarded the Vanke A-class supplier. In 2018, Nippon Paint was awarded the 2017 Country Garden Group Excellent Supplier Award. 2018 China Paint Brand Ceremony, CLS Award, “the influence wood paint brand”. 2018 China Paint Brand Ceremony, CLS Award,“the influence Furniture paint brand”. The first “2018 Staff care demonstration unit "honor of Jinqiao Economic-Technological Development Area, Shanghai. 2018 China Association for Quality Inspection“National Quality Integrity Demonstration Enterprise”. 2018 China Association for Quality Inspection“National Quality Integrity Benchmark Enterprises”. 2018 China Association for Quality Inspection “Leading Enterprises in the National Coatings Industry”. 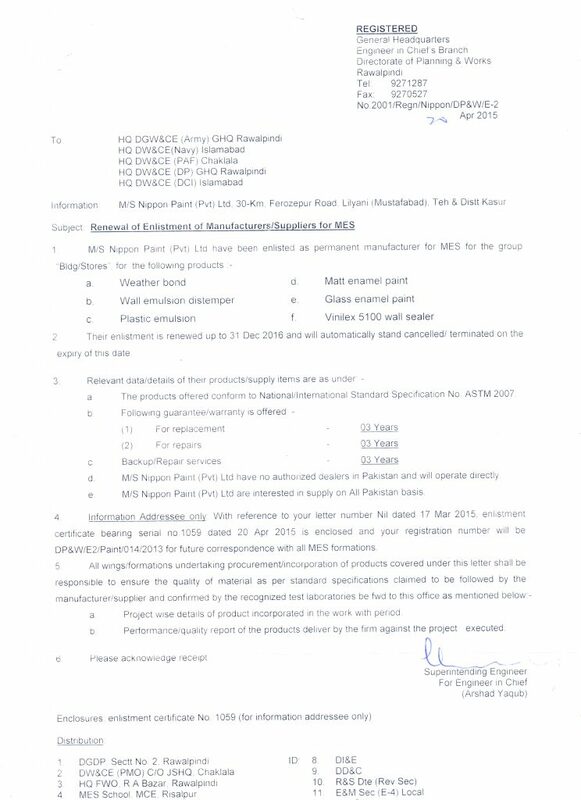 2018 China Association for Quality Inspection “Qualified Products from National Quality Inspection”. 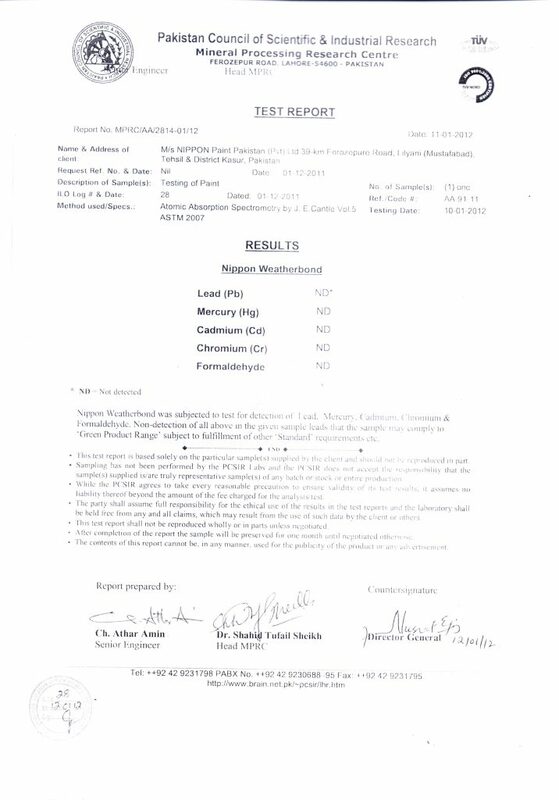 2018 China Association for Quality Inspection “National Quality Trustworthy Products”. 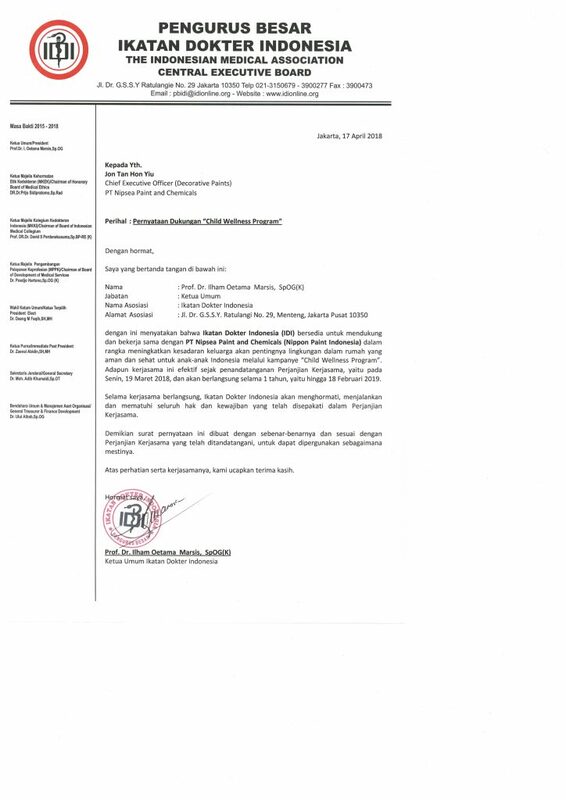 2018 China Association for Quality Inspection “National Leading Brand in Coatings Industry”. 2018 China Financial Summit, the excellent brand image award of 2018.
of Year 2018 in Paint industry. 2018，Shanghai Chemical building materials Top 10 Brand” Top Ten Leading Brands of Architectural Coatings in 2018”. 2018，Shanghai Chemical building materials Top 10 Brand”2018 Shanghai Construction and Innovation Enterprise”. The Hong Kong Green Label Scheme (HKGLS) is an independent, non-profit-making and voluntary scheme for the certification of environmentally preferable products launched in December 2000 by Green Council (GC). 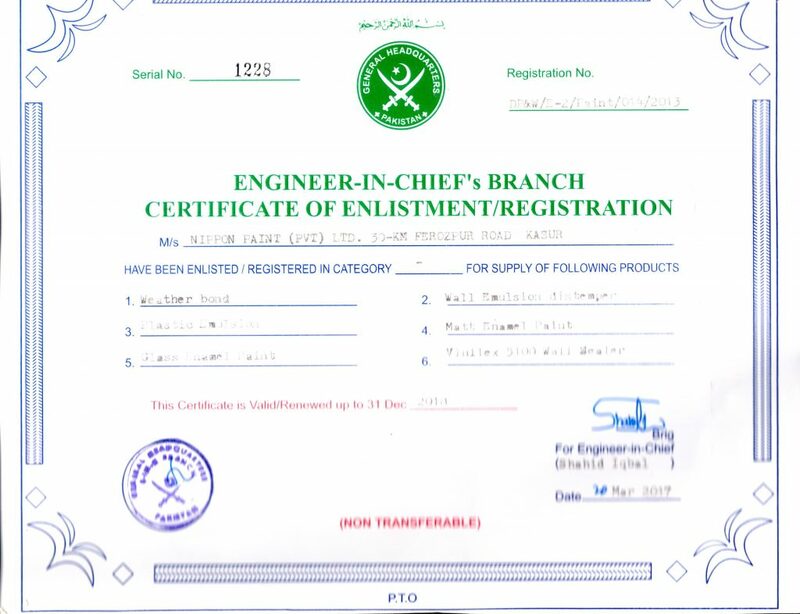 The scheme sets environmental standards and awards its "Green Label" to products that are qualified regarding their environment attributes and/or performance. As with all ecolabelling schemes, the aim is to encourage manufacturers to supply products with good environmental performance and provide a convenient means for consumers to recognise products that are more environmentally responsible, thus promoting a more sustainable pattern of consumption. 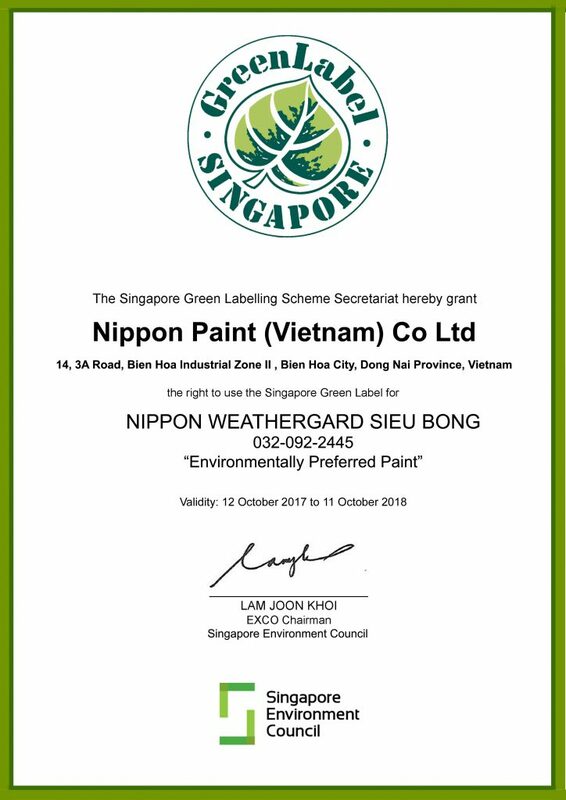 Nippon Paint (HK) Co. Ltd was awarded "Hong Kong Green Label Certificate” due to a product's superior environmental performance and commitment to protect the environment and also improve environmental performance in manufacturing processes generally leads to significant cost savings associated with effective resource use, waste minimization and recycling, and reduced business liability. At the Caring Company Recognition Ceremony held at the Hong Kong Convention and Exhibition Center on 16 March 2018, Nippon Paint (HK) Co. Ltd was granted with the Caring Company Logo 2016/18 from the Hong Kong Council of Social Service (HKCSS) in recognition of its corporate citizenship. The mission of this Caring Company scheme is to build a cohesive society by promoting strategic partnerships among business and social service partners and inspiring corporate social responsibility through caring for the community, employees and the environment. We will carry on the caring spirit and demonstrate a good corporate citizenship. 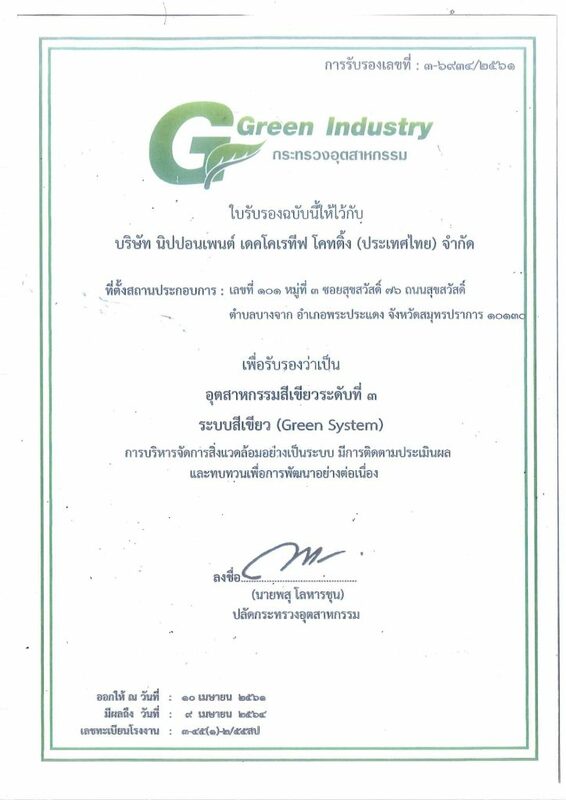 U Green Awards, which aims to recognize the outstanding environmental achievements of organizations and industries, has been organized for 8 years. The 2017 award presentation ceremony was held on 9 October 2017. Nippon Paint (HK) Co. Ltd was awarded "Excellence of Green Contribution Award” in the category of household item by providing sustained contribution to the social and environmental protection. 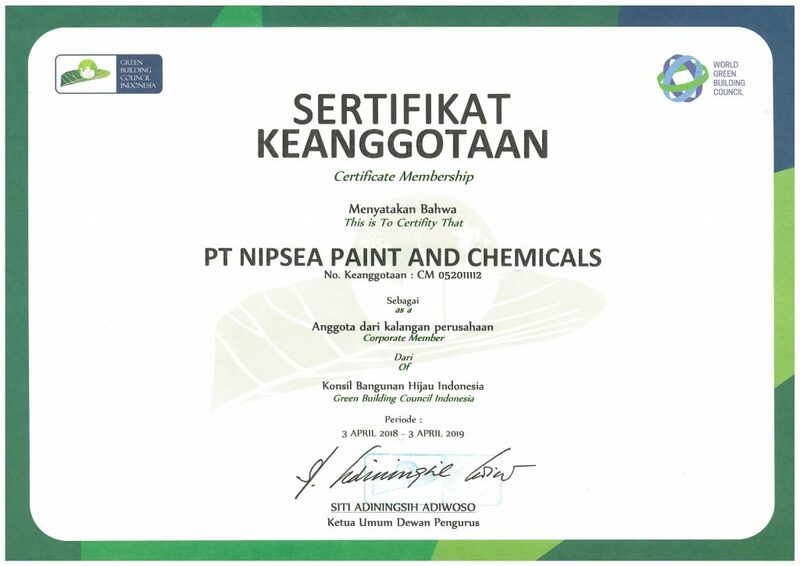 Nippon Paint not only develops a range of environmentally friendly products, but also introduces environmentally friendly energy-saving products, which can reduce the indoor temperature, reducing power consumption and carbon emissions to formulate a healthy and green life. East Week magazine's "Eco-brands Awards 2017" salutes companies for caring about environmental issues, sharing 'green' messages and taking measurable steps to preserve the world's precious natural resources. Winners were selected by professional judging panels, and public online voting. Nippon Paint Odour-less Kids Paint got this certification which define low-emitting materials suitable for environments where people, particularly children and sensitive adults, spend extended periods of time, in particular schools and healthcare facilities. Since launch in 2015, “HKGBC Green Product Accreditation and Standards (HK G-PASS)” established standardised measures in the green impact of the building products. The certification scheme focuses on various aspects such as raw materials, manufacturing process, embodied carbon, toxicity, etc. 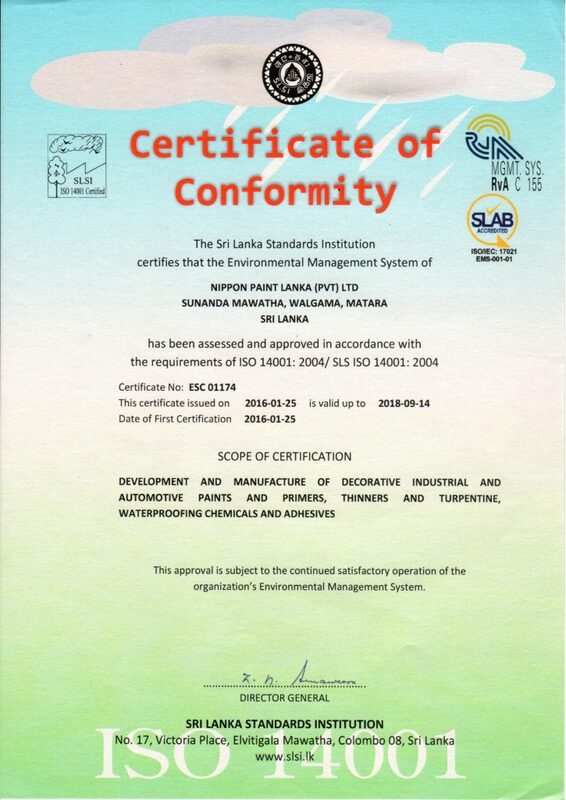 Certified green products may contribute to credits achievement in BEAM Plus the green building assessment scheme, e.g. in MWA 2 under BEAM Plus Existing Buildings (EB) V2.0. 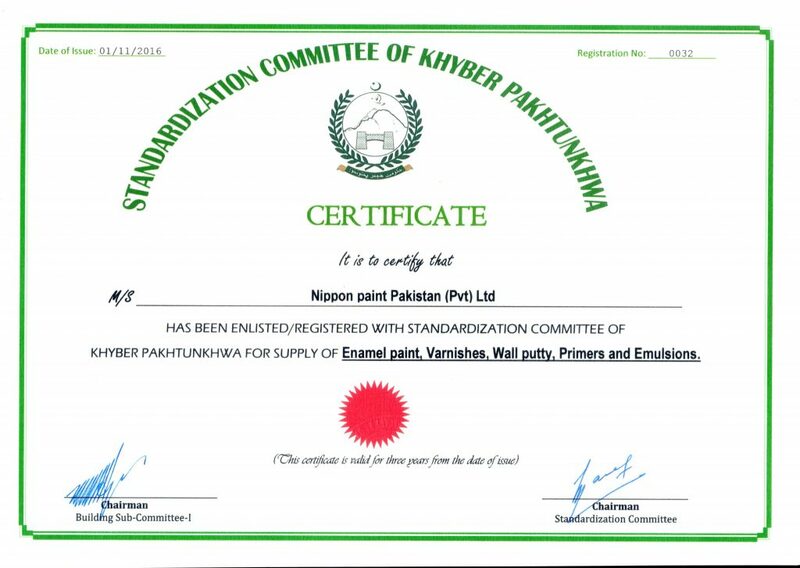 Nippon ZeroTec Interior Emulsion Paint got this certification and it offers standardised criteria to assess the environmental performance of various kinds of green building products, with a view to facilitating industry buyers in making smart purchases of green building products. GreenCO Gold certified by CII (Confederation of Indian Industries). 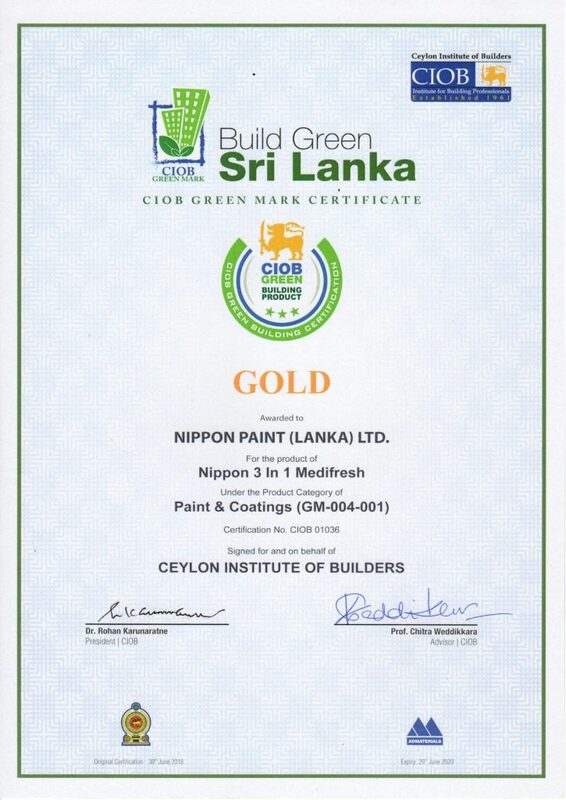 We are the first paint manufacturing company in India to receive GreenCO Gold and GreenPRO certification from CII. Founding Member of IGBC (Indian Green Building Council). 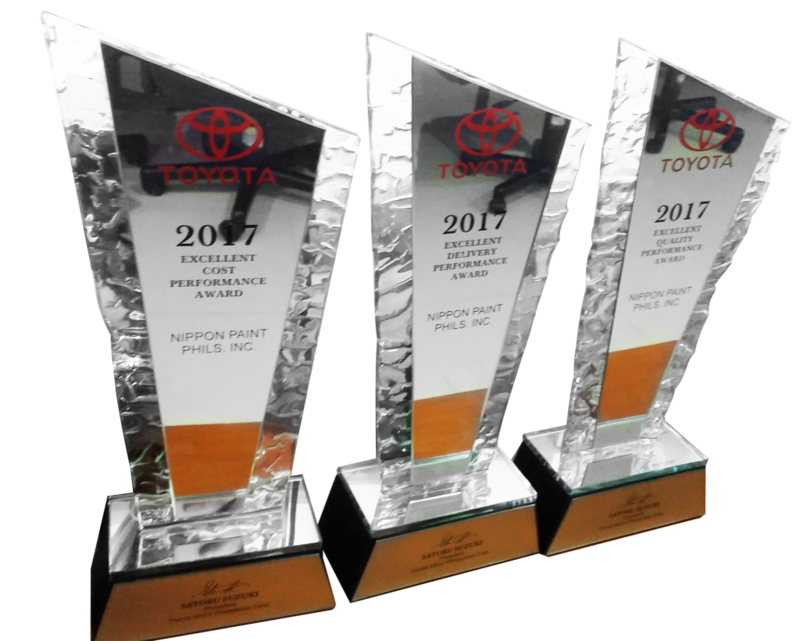 Nippon Paint Automotive Coatings Co., Ltd. (NPAU; Headquarters: Hirakata City, Osaka Pref., Japan; President: Mitsuo Yamada) received the Special Excellence Award for Quality Control at the policy meeting of Toyota Housing Corporation in April 2018. 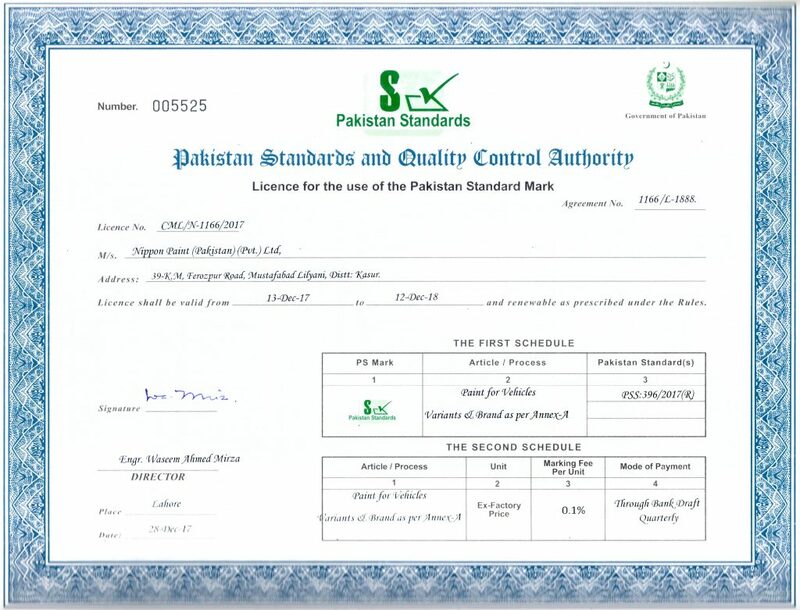 It was awarded to the company in recognition of achieving zero quality defects in its products. 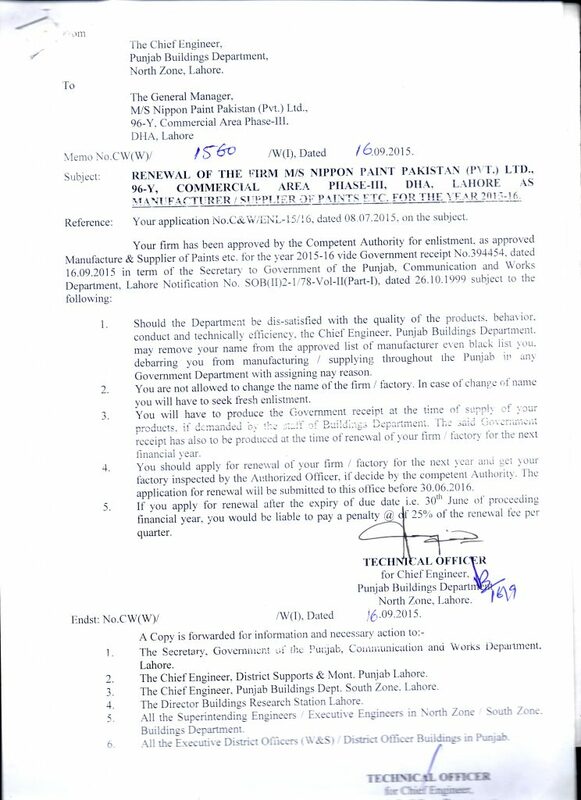 The company has won this award for seven consecutive years. 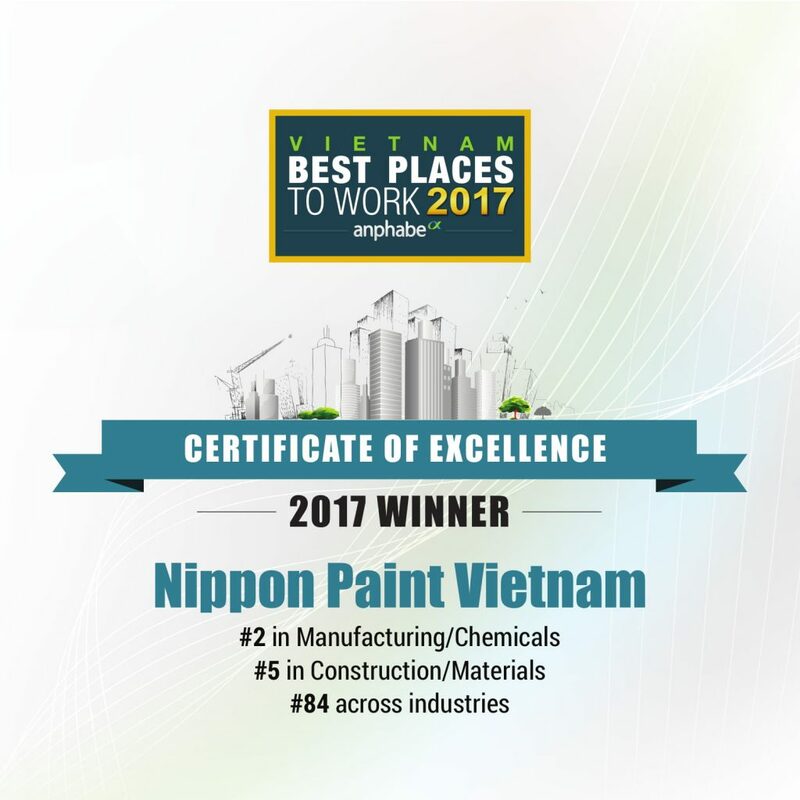 Nippon Paint Holdings Group continues to focus its efforts on providing quality products and services that satisfy its customers. Nippon Paint Tintas Automotivas do Brasil Ltda. 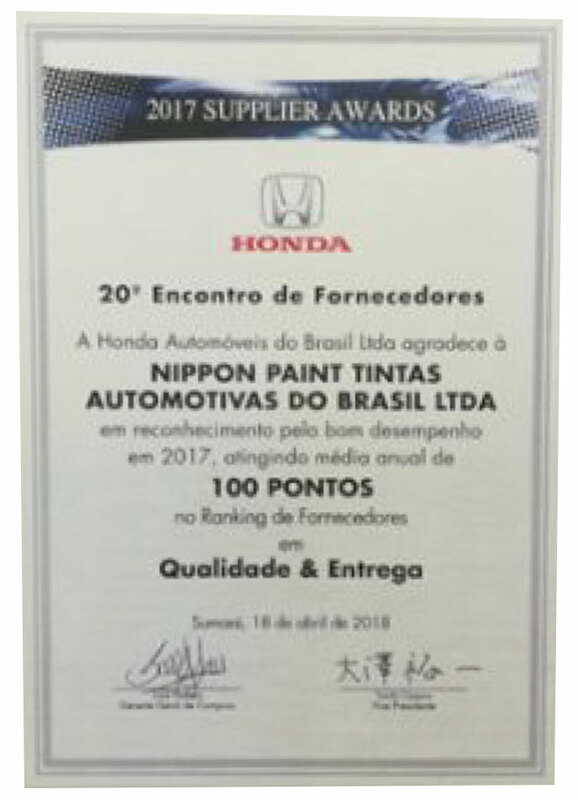 (NPABR, located in Brazil), a subsidiary of Nippon Paint Automotive Coatings Co., Ltd. (NPAU; Headquarters: Hirakata City, Osaka Pref., Japan; President: Mitsuo Yamada), was commended by Honda Automoveis do Brasil Ltda. at the Supplier Awards 2017 ceremony. The “Qualidade & Entrega” (Quality & Delivery) award has been presented in recognition of NPABR’s performance in bumper primer business. 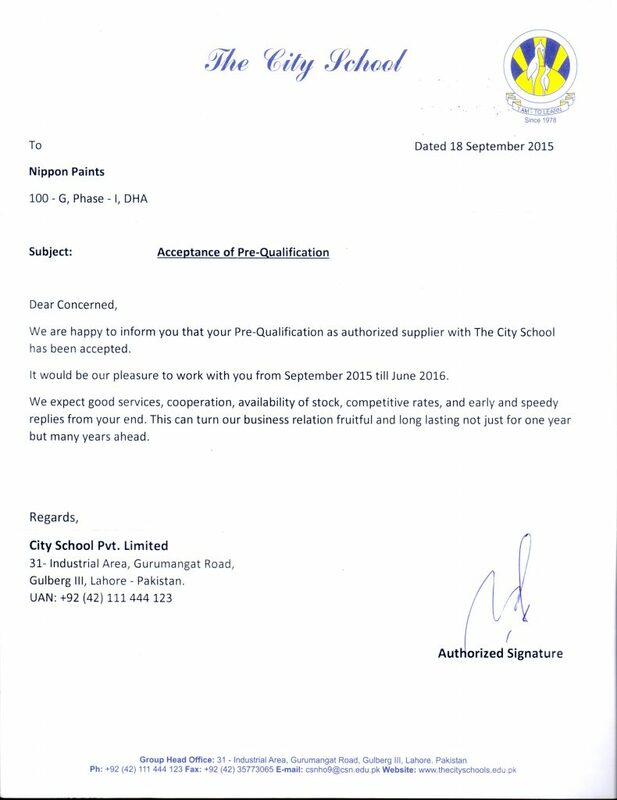 This is the first commendation that the company has received from one of its customers since its establishment. 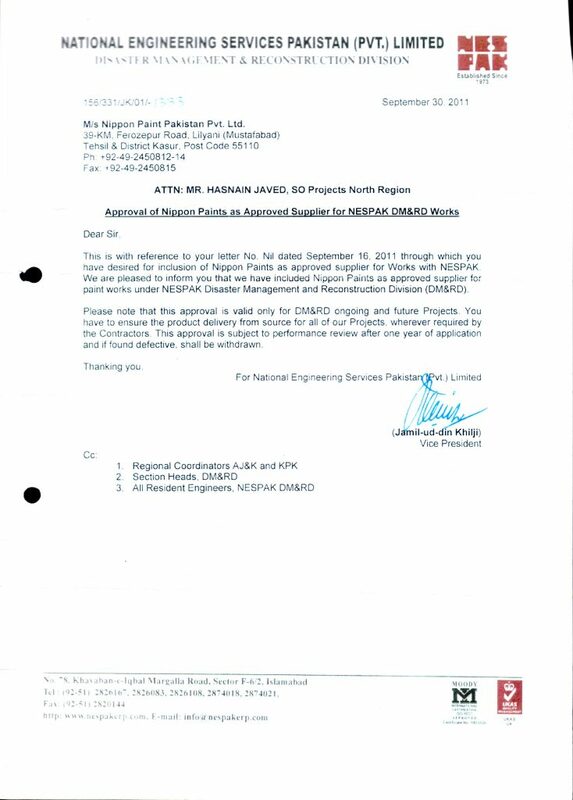 Nippon Paint Holdings Group continues to extend all-out support to its local subsidiaries. 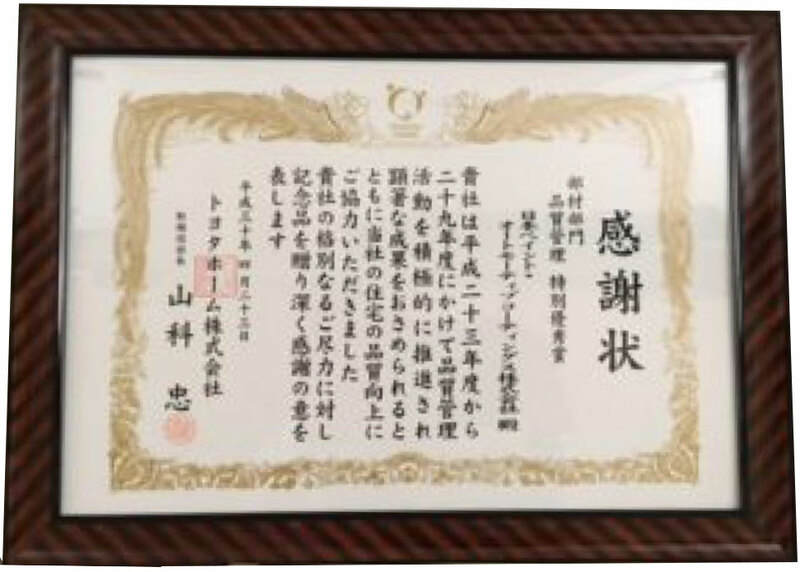 On May 25, 2018, the R&D Headquarters of Nippon Paint Holdings Co., Ltd. (NPHD) received the 70th Chemical Technology Award under the theme of “Japanese paper-design paint—paint to add Japanese texture—.” This is a traditional and prestigious award, whose previous honorees include the late Prof. Kenichi Fukui of the Faculty of Engineering, Kyoto University, who was the first recipient of the Nobel Prize in Chemistry from Asia. “Japanese paper-design paint” is literally a special paint that can easily reproduce the texture of washi (Japanese paper) simply by applying it. The fibers composing washi are said to be difficult to disperse. However, NPHD’s newly developed dispersion technology enabled the company to process them into a paint. 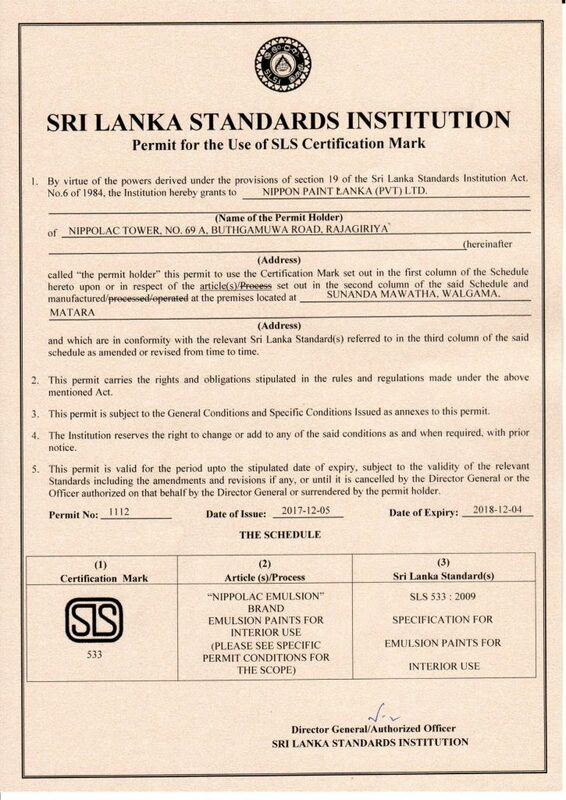 The company is currently making efforts towards its commercialization. Actual application of the paint can be seen in the company’s Suita dormitory in Osaka and a meeting room in the Tokyo Center Building. Feel free to visit these places if the opportunity arises. The R&D Headquarters continues to develop new technologies with the mission of providing technological support for the Group to remain competitive in any future business environment. 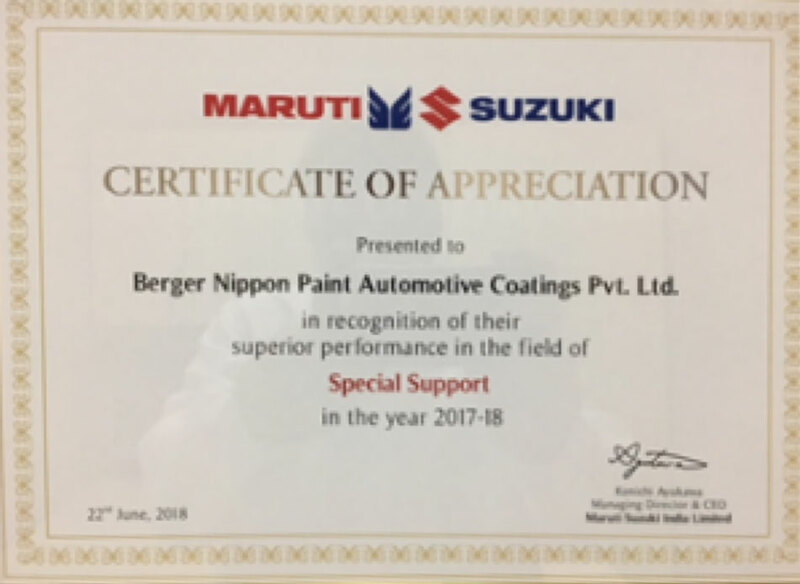 Berger Nippon Paint Automotive Coatings Private Limited (BNPA), an Indian subsidiary of Nippon Paint Automotive Coatings Co., Ltd. (Headquarters: Hirakata City, Osaka Pref., Japan; President: Mitsuo Yamada), received the Special Support Award 2017-2018 from Maruti Suzuki India Limited. 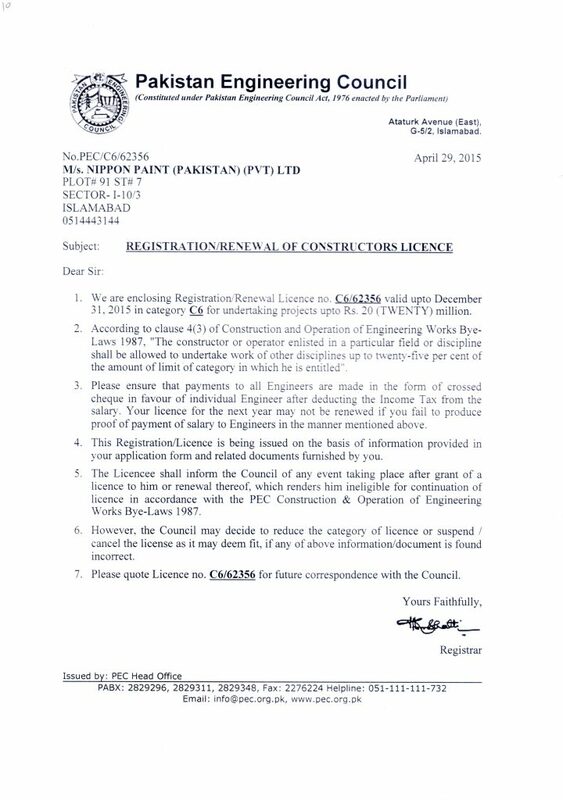 It was awarded to the company in recognition of being an excellent supplier in the paint sector. 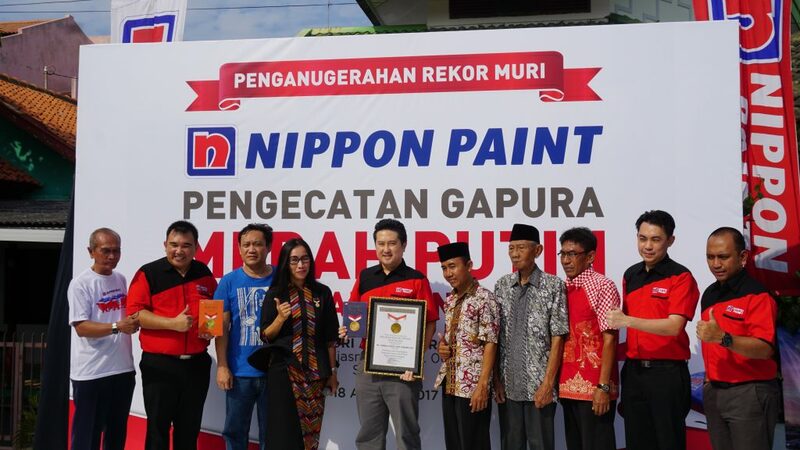 Nippon Paint Holdings Group continues to contribute to its customers and local communities, aiming to be a reliable supplier for all. 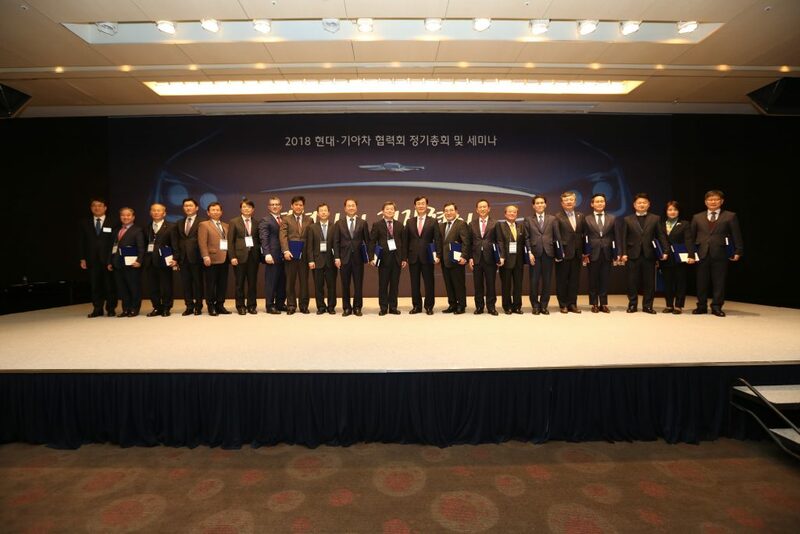 In January 2018, NCK was awarded the Best Supplier Award from Hyundai Motors Group, one of the leading global auto maker. By this award, NCK was recognized as the best partner with reliability, understanding customer needs, Innovation & Value creation. 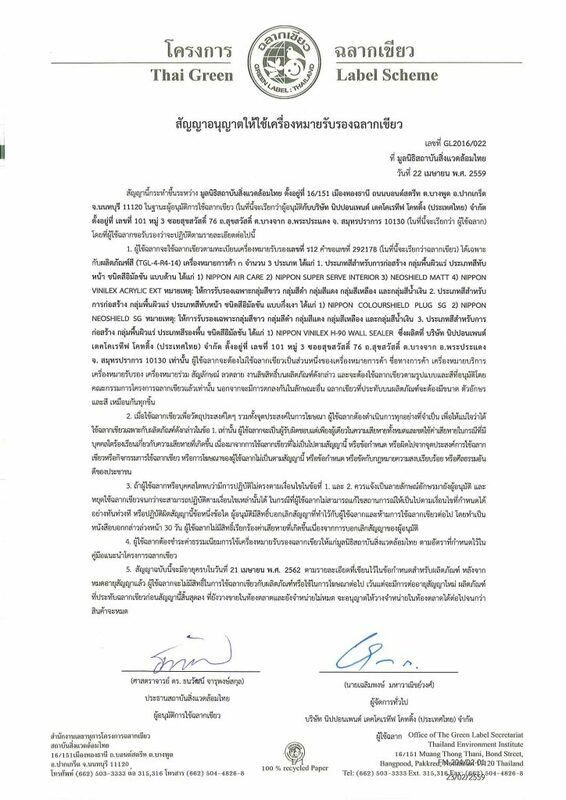 It will also be the great opportunity to strengthen brand value in the minds of other consumers in the future. 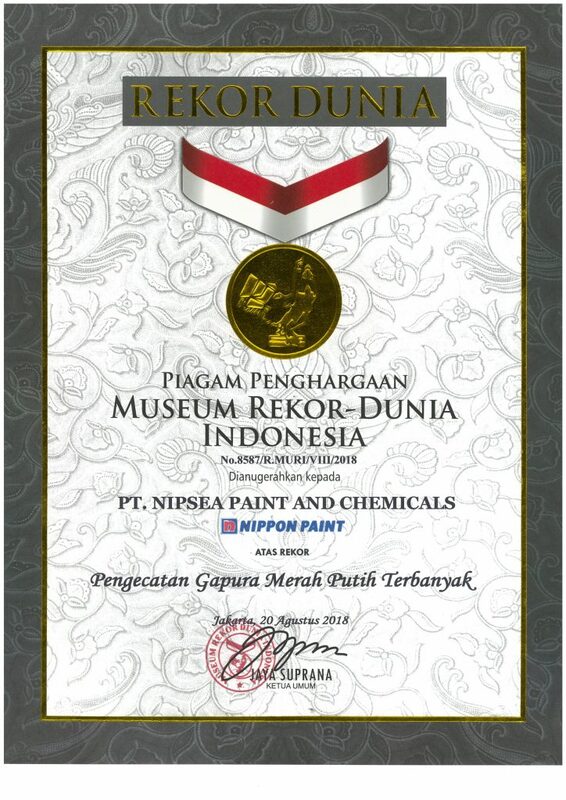 Gold Award for the Paint Category, being the consumers’ most trusted brand among other industry players. Silver Award for the Household & Home Improvement category, recognizing brand building as an integral business investment, measured by consumer preference. Bronze Award for the Household & Home Improvement category, recognizing brand building as an integral business investment, measured by consumer preference. Bronze Award for the Home Improvement category, recognizing brand building as an integral business investment, measured by consumer preference. Silver Award for the Home Improvement category, recognizing brand building as an integral business investment, measured by consumer preference. Being recognized as exhibits excellence in growth strategy and implementation, degree of innovation with new products and technologies, leadership in customer value and market penetration. 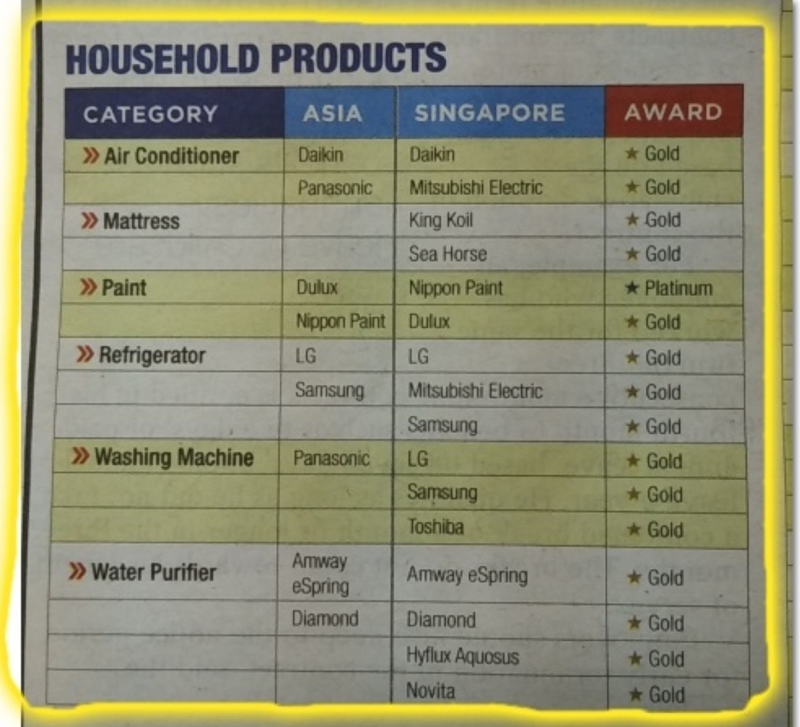 Platinum Award for the Household Products Category, being the consumers’ most trusted brand among other industry players. Bronze Award for the Household Supplies and Services category through Paint New Happiness campaign, recognizing ideas that work and effective marketing communication strategies. Bronze Award in Household Supplies and Services category. Bronze Award for the Home Improvement Product & Stores category, recognizing brand building as an integral business investment, measured by consumer preference. Gold award for the Consumer Services category through Child Wellness Range campaign, being recognized as the industry’s best marketing ideas. Bronze Award for Home Improvement Category with If you can dream it, you can pylox it campaign. Silver Award for the Home Improvement Product & Stores category, recognizing brand building as an integral business investment, measured by consumer preference. Silver Award for Consumer Launch category. 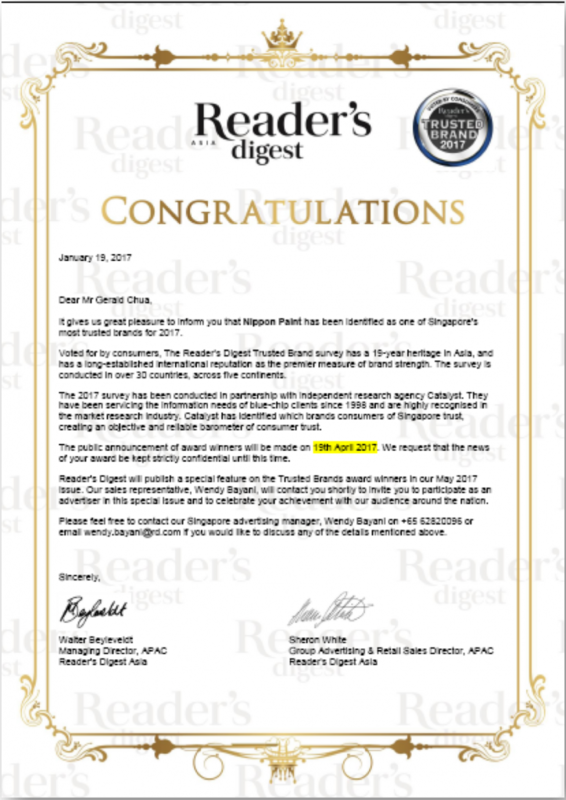 Reader's Digest in Singapore has a circulation of about 84,000 copies with readerships of over 176,000. 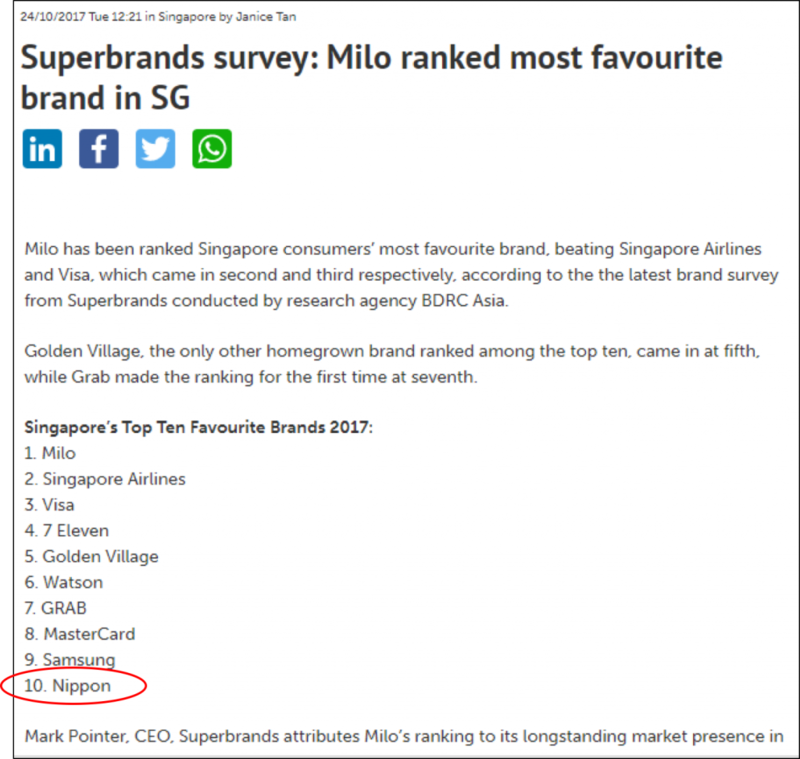 ♦ Superbrands conducted a survey and the results of it puts us at number 10 on the list of Singapore’s top ten favourite brands of 2017.